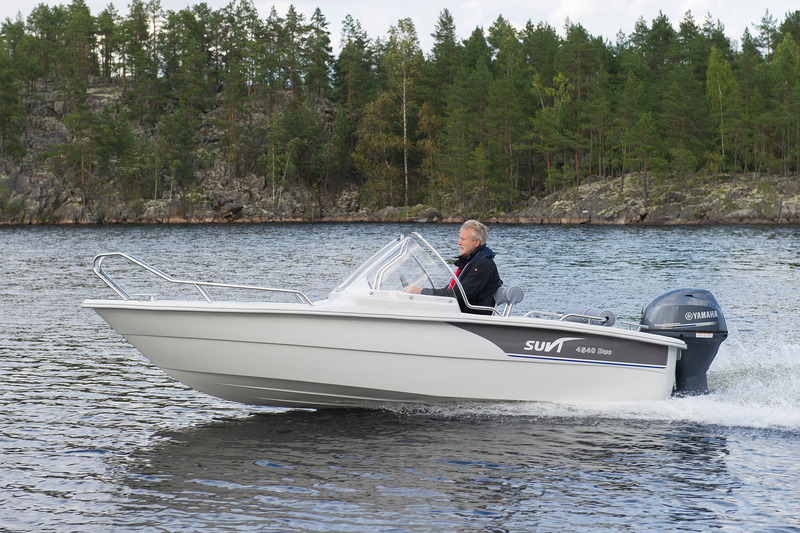 The history of Suvi boats began in 1985. 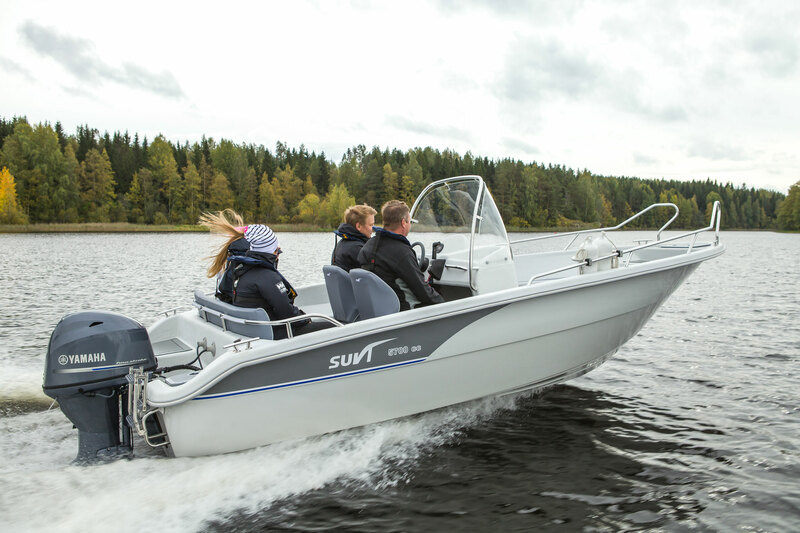 Over the last 30 years, Suvi boats have become the leading brand of small boats in Finland and the number of boats sold has risen to around 63,000. 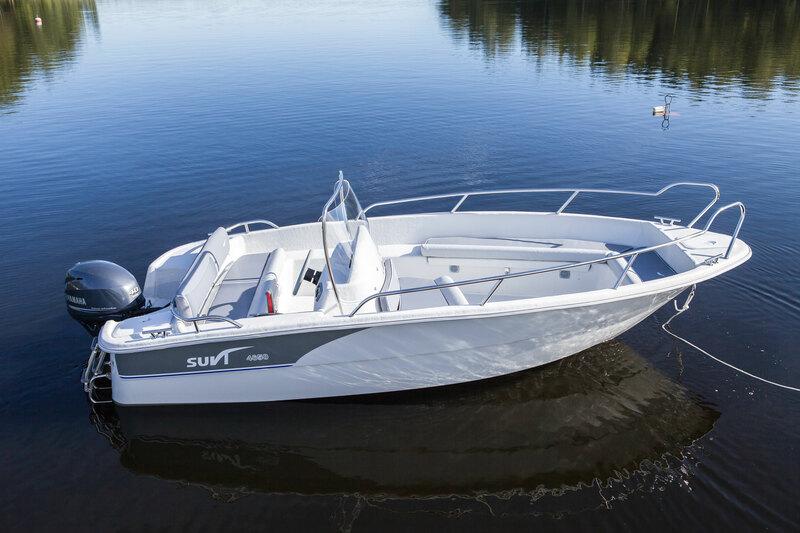 The current production comprises 28 models and there is certainly an affordable alternative for cabin boats or fishing boats for everyone. 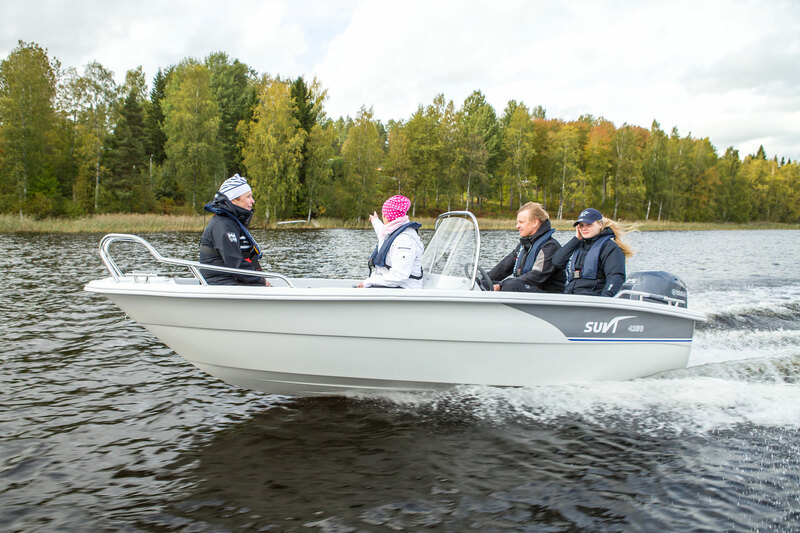 Suvi is Finland’s leading brand of small boats that are also built in Finland. 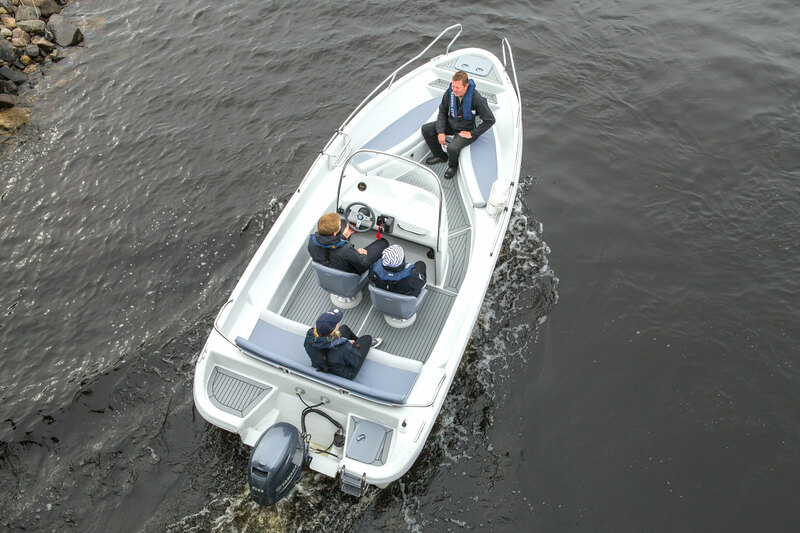 The range comprises 24 models, from a dinghy and canoe to rowing boats, combination rowing and outboard boats, boats well-suited for fishing with nets and console boats fitted with automatic rainwater drainage. 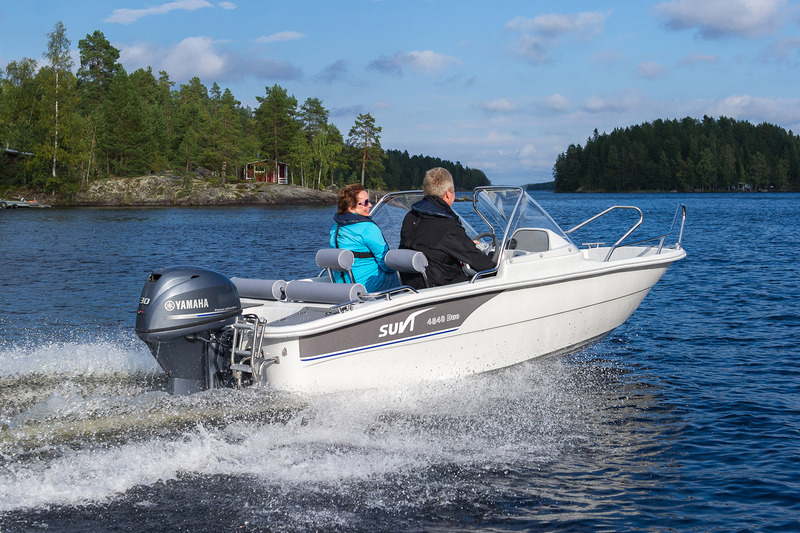 Attractive appearance, practical equipment and affordable price combined with excellent properties make each boat in the Suvi range a smart buy, one that will retain its value and arouse interest in the used boat market as well. 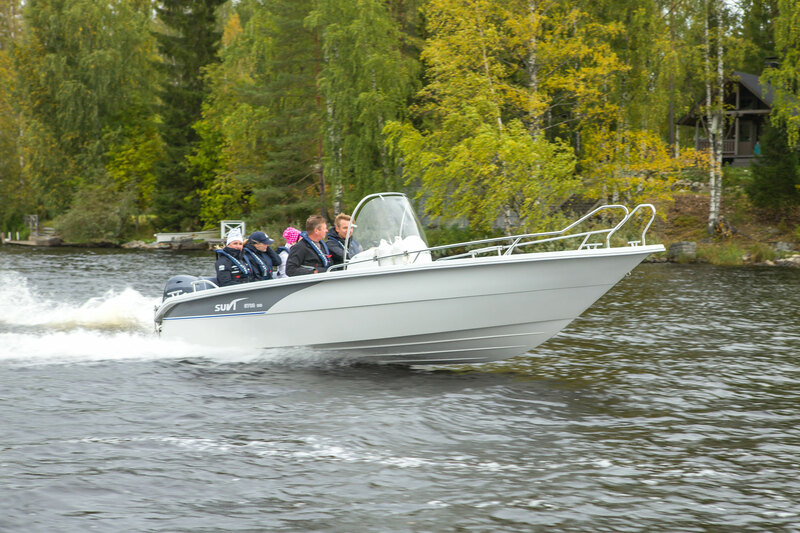 The 5750 Duo model is equipped with a larger open aft space and excellent standardequipment that make it an outstanding summer house, fishing and travel boat in the archipelago and larger lakes. 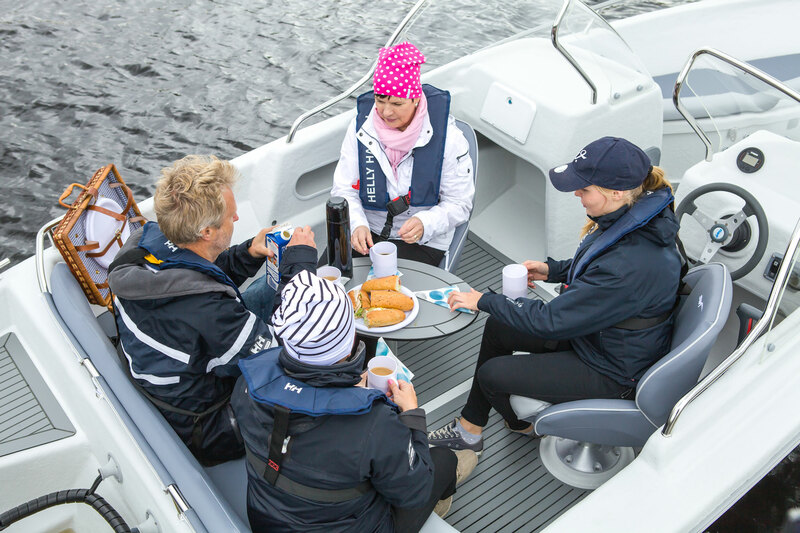 The large aft space is very suitable for fishing, for example, and a table – available as an extra accessory – makes lunch breaks a breeze. Unbeatable driving features, a practically non-existent planing threshold and great directional stability. Self-draining. Wide-ranging engine recommendations for versatile purposes. 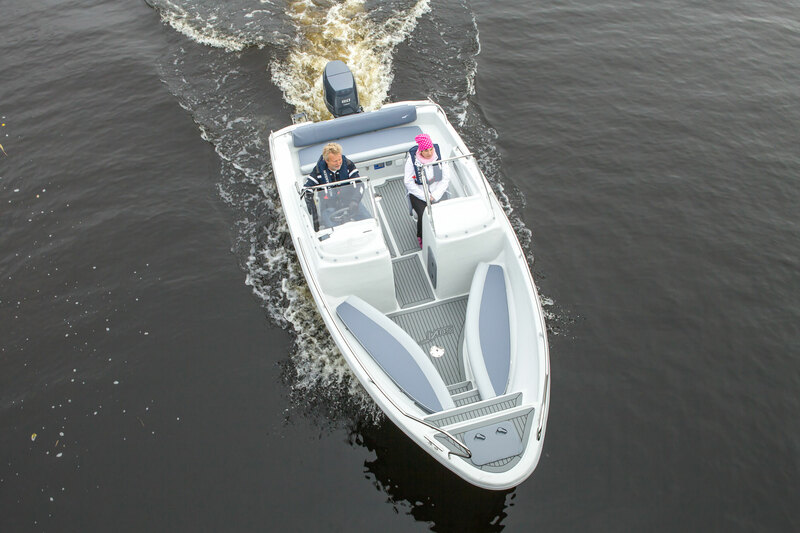 The new aft cabin canopy offers more space and height than its predecessor. 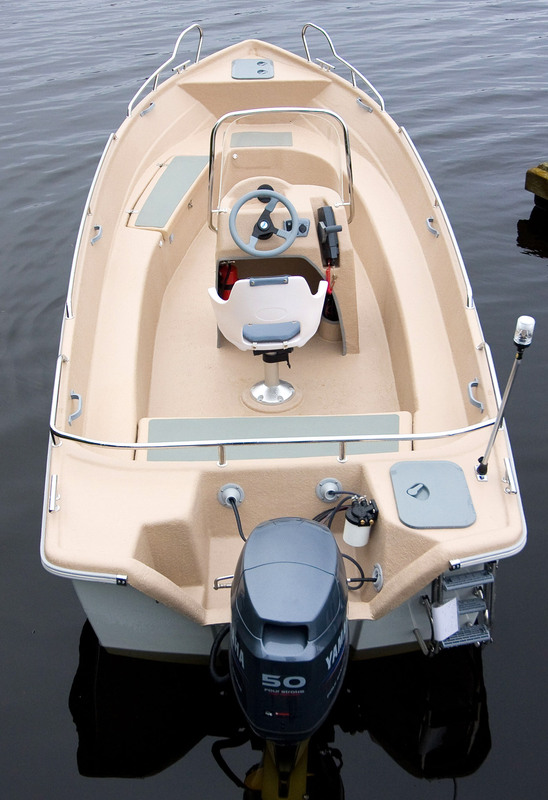 Standard equipment includes bucket seats lined with artificial leather, a laminate kit and a stainless steel keel. 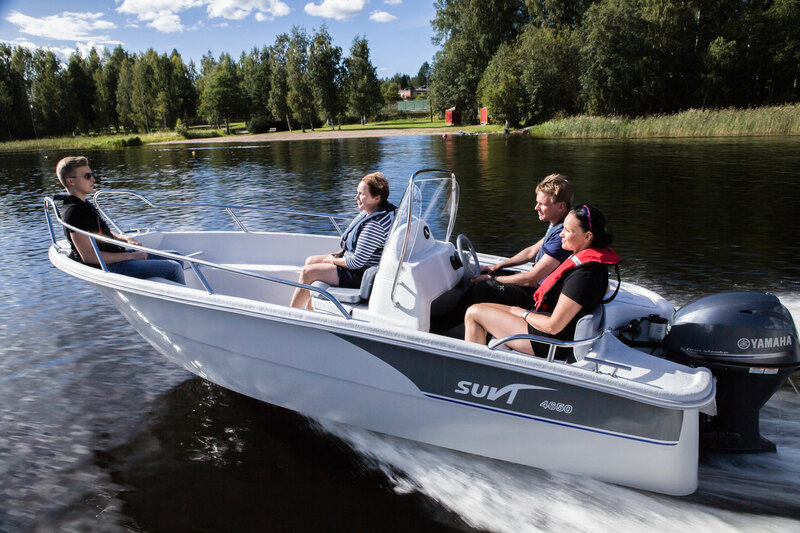 Suvi 5700 CC, with a wide center console and two adjustable seats, is a new more affordable model for the popular six-metre open boat class. 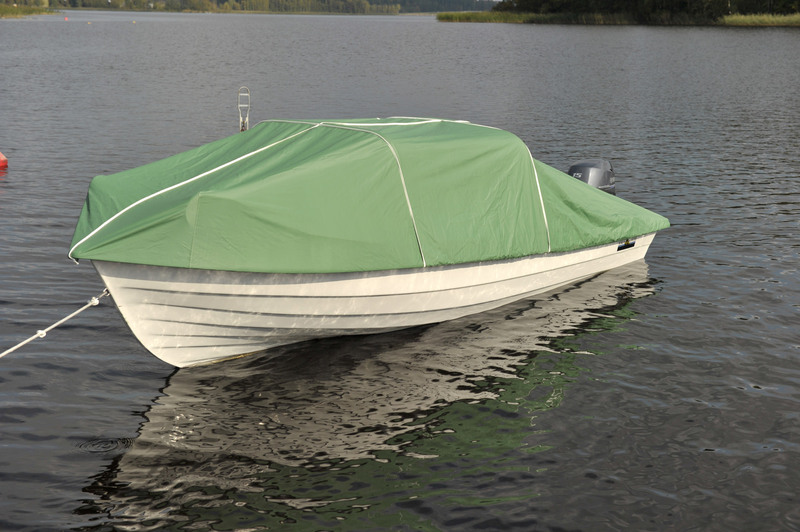 It suits summer house usage, fishing or connections even in rough waters. Excellent handling. Spacious inside with room for movement and fishing. 2 long storage compartments for eg. fishing rods. Engine recommendation max. 80 hp, for long rigg engine.Excellent already with 50 hp. Rainwater drainage. 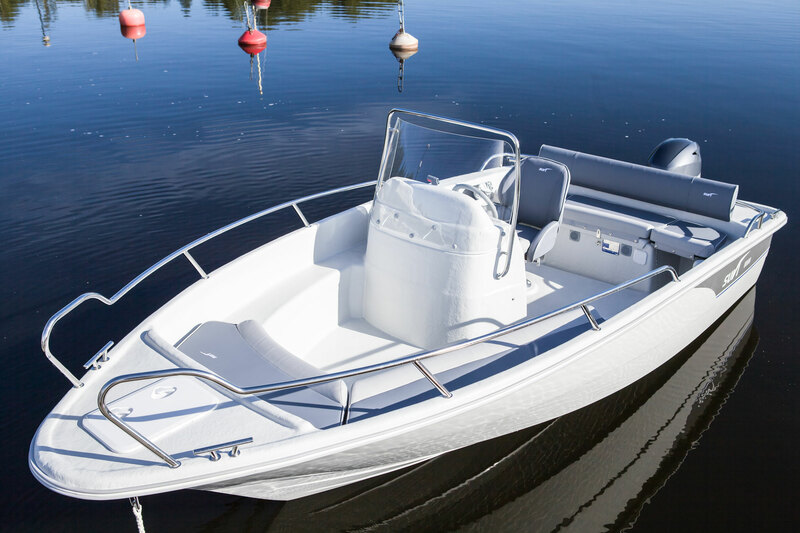 Standard equipment now includes a stainless steel keel and bucket seats lined with artificial leather. 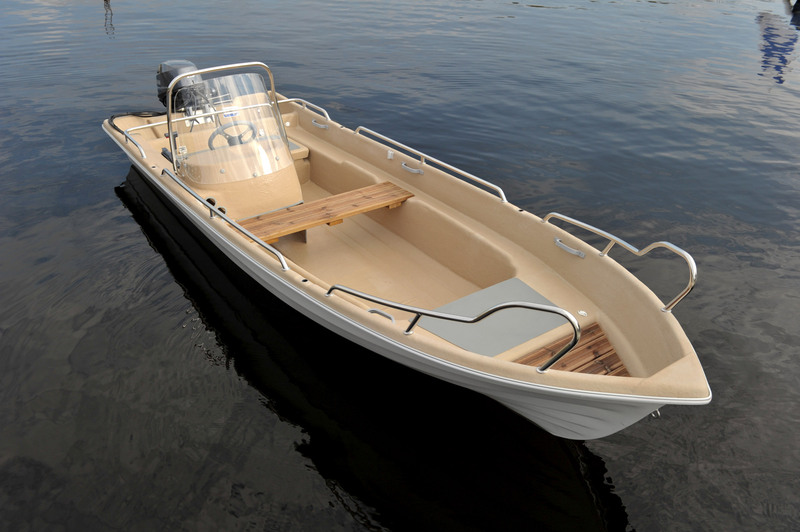 A fishing boat for summer cottage enthusiasts. 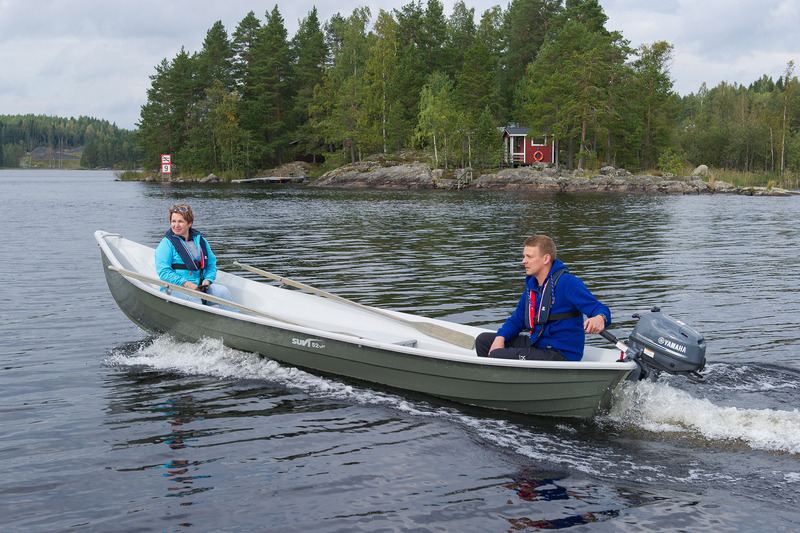 A general-purpose boat for the summer cottage that also accommodates a fisherman’s needs. Plenty of open space for fishing and moving around. Long storage space for implements such as fishing rods. New concept: side console far forward and a seat with legs. Aft section adaptable for various purposes. For a long shaft outboard engine. 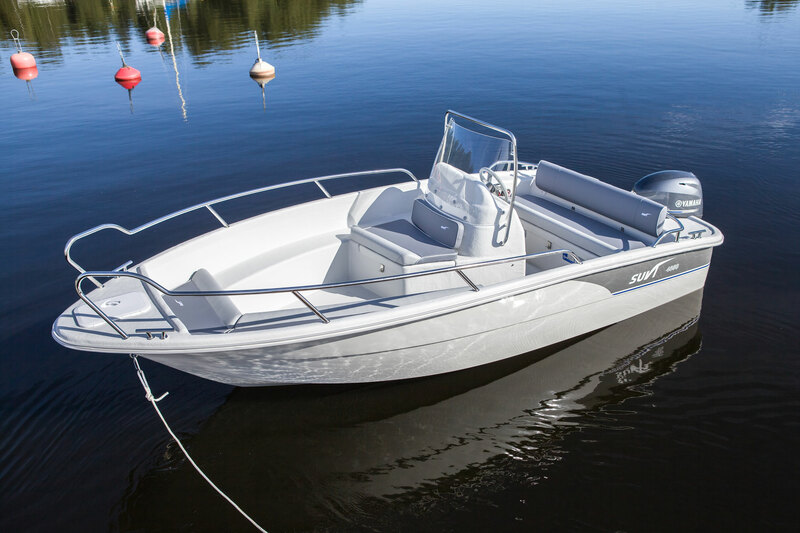 Standard equipment now includes a stainless steel keel and artificial leather bucket seat. 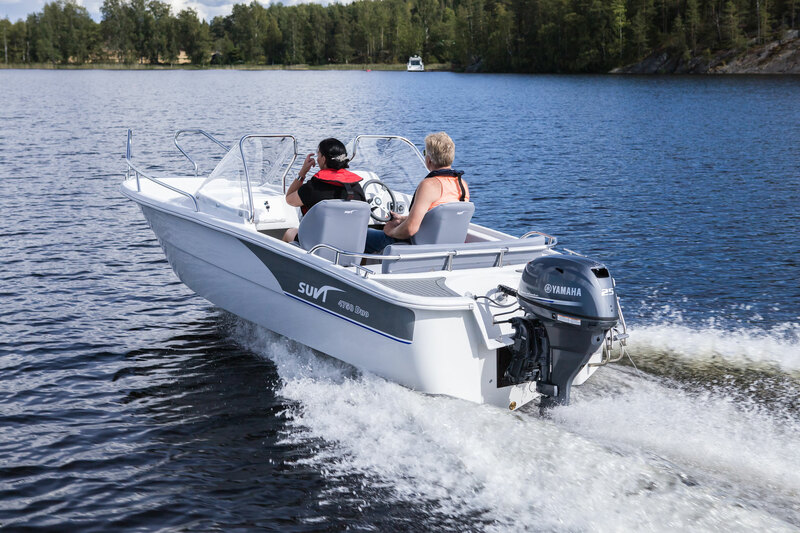 A summer cottage and fishing boat equipped with two steering consoles. Excellent handling characteristics. Self-draining. 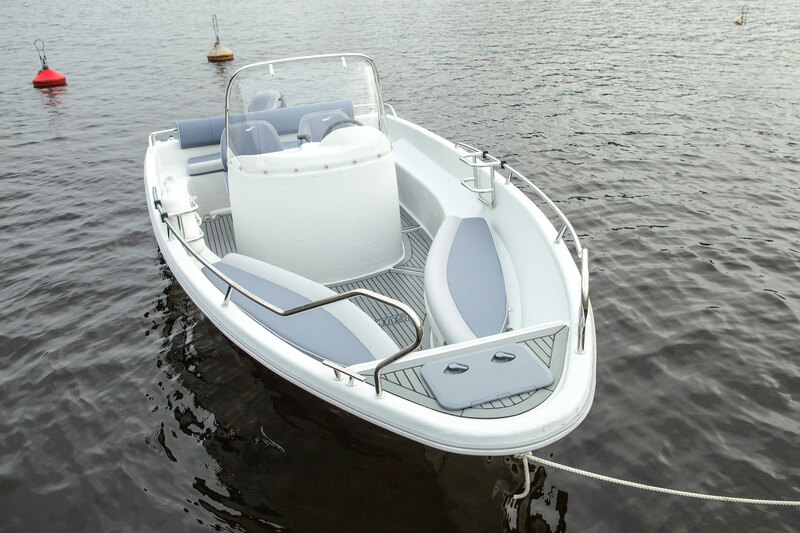 The boat’s standard equipment includes windshields offering good protection, a generous amount of railings, 4 pcs stowage spaces, of which 2 lock, etc. The recommended engine is 40–60 hp. A wide model extremely stable athwartship. For a long shaft outboard engine. 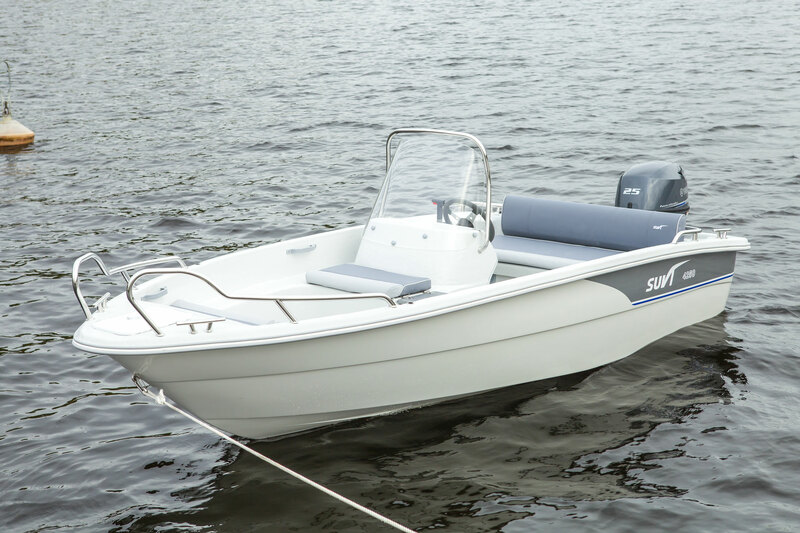 Standard equipment now includes a laminate kit, a stainless steel keel and bucket seats lined with artificial leather. 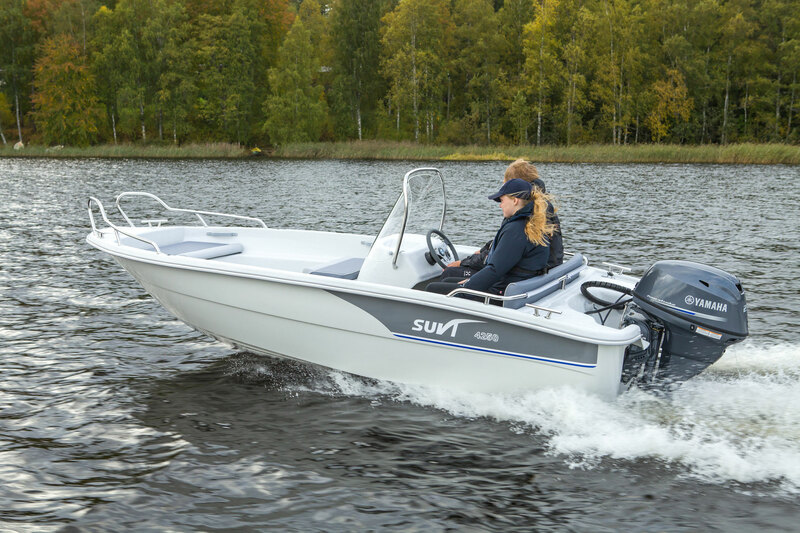 Suvi 4750 is a versatile and affordable double-console model equally suitable for travel, fishing or use at the summer house. 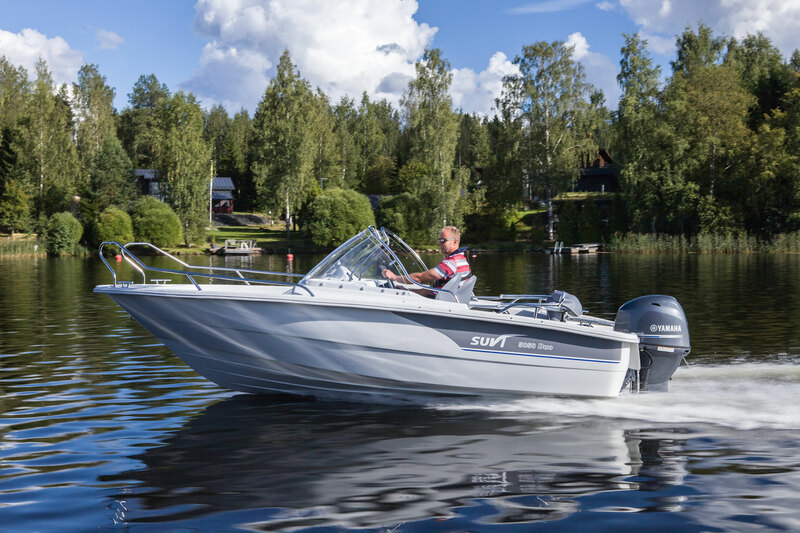 Due to its lightness, the boat will run well with less powerful engines as well. 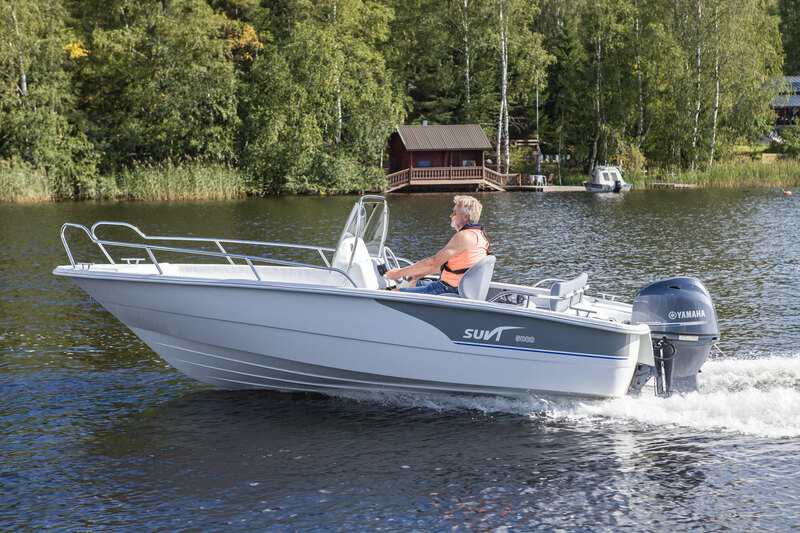 The Suvi 4750 Duo is a versatile boat for four. 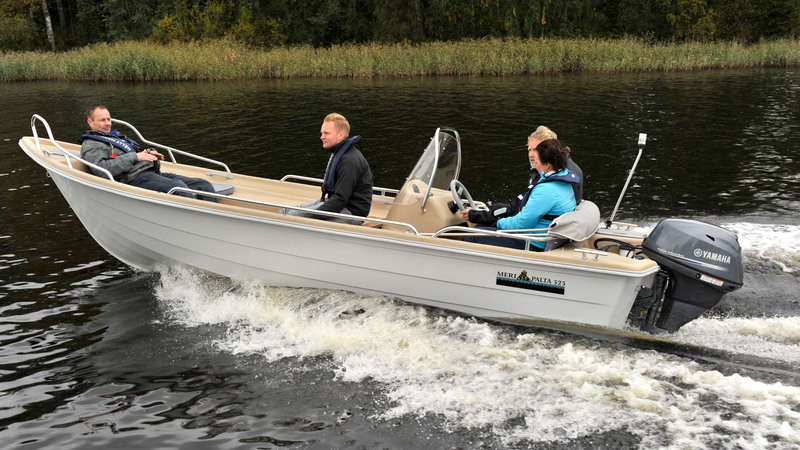 This double-console model is equipped with a rainwater drainage system and equally suitable for travel, fishing or use at the summer house. 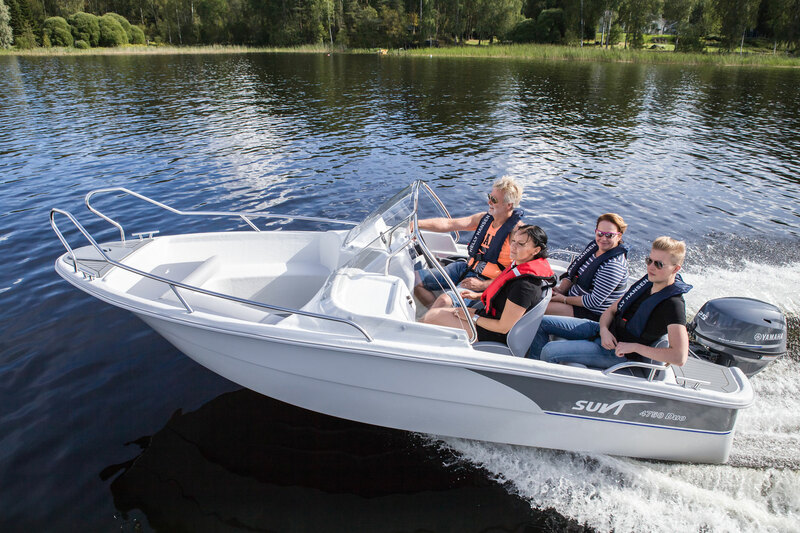 Being light (310 kg), the boat can sustain a comfortable travel speed (roughly 28 kn/1 person, or 23 kn/4 persons) with just a 40 hp outboard engine. For price information, please contact your local dealer. 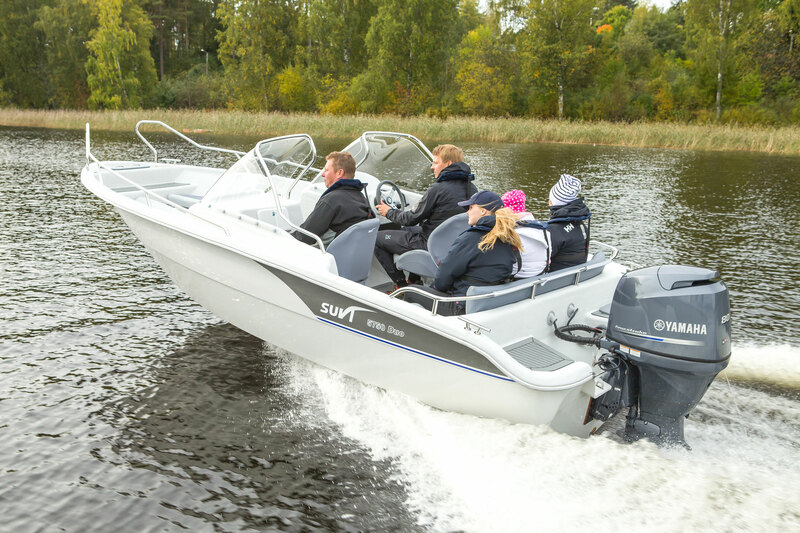 The Suvi 4650 is a self-draining model with excellent handling characteristics and extremely ample stowage space, including a 140 cm long compartment for e.g. fishing rods. 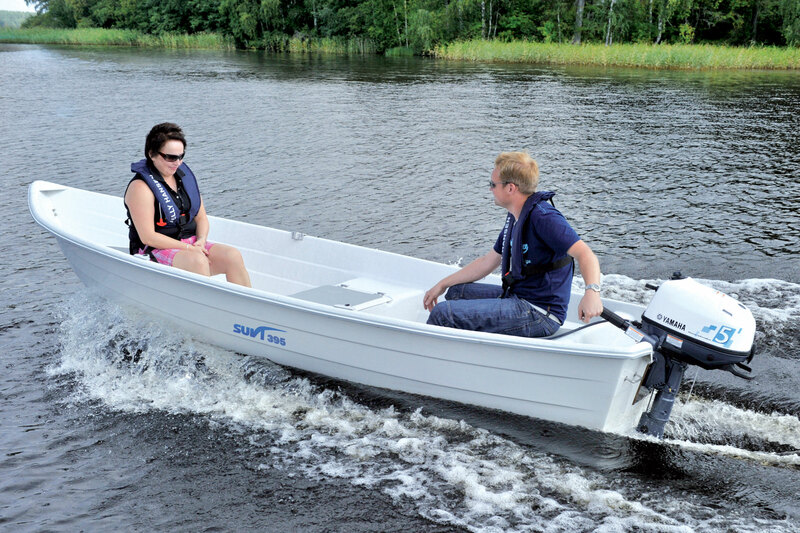 The boat has rails, windscreens and swim ladder as standard accessories. For a long shaft outboard engine. Standard equipment now includes a stainless steel keel. 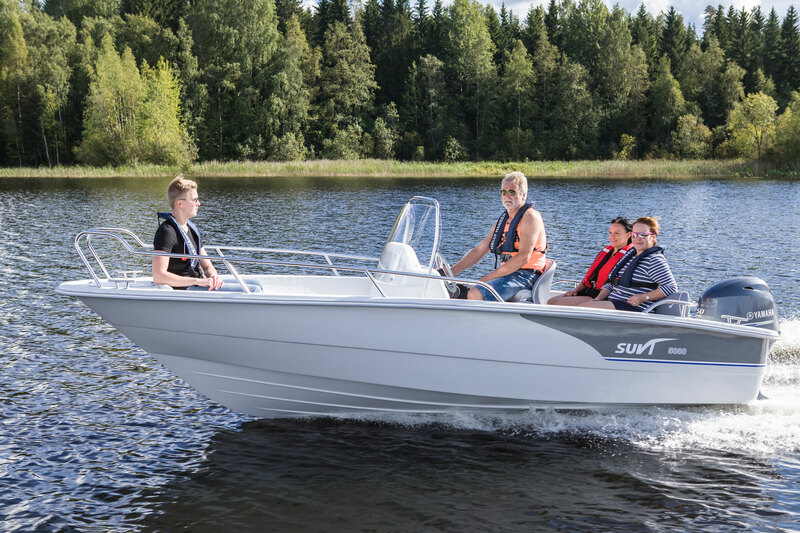 The popular Suvi Duo model range will be complemented with the most inexpensive double console boat on the market. The tried and tested concept will be introduced into a completely new size category. 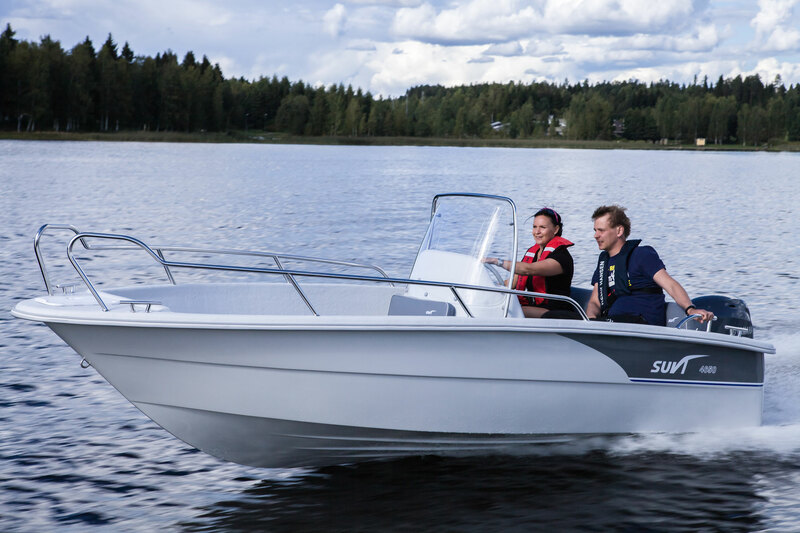 This allows the buyers of slightly smaller and less expensive boats to enjoy the benefits and features of a double console boat. 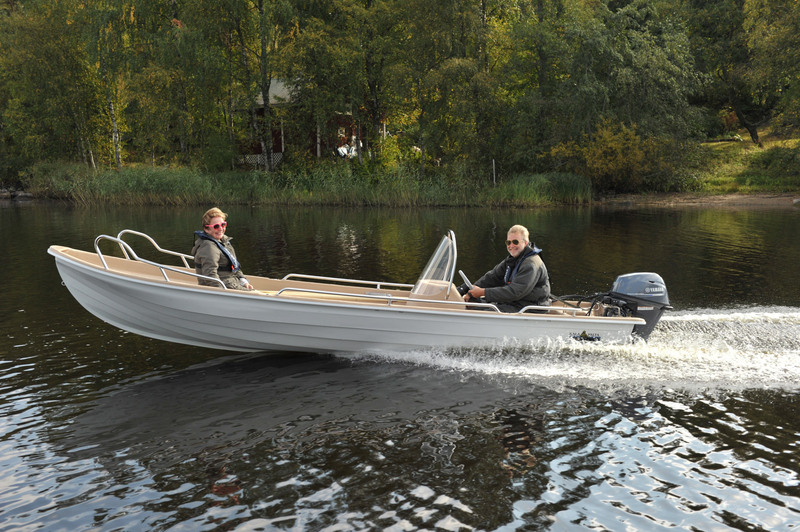 4540 Duo is a model provided with good standard equipment for fishing or use at the summer house. 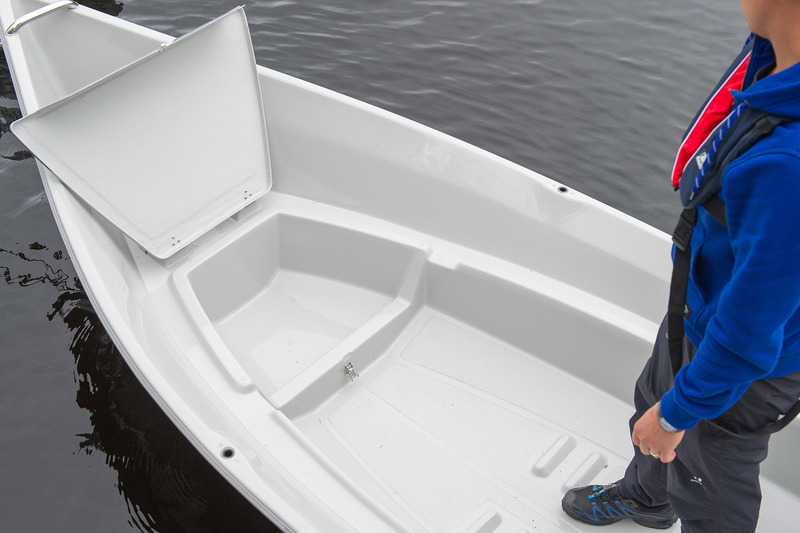 The boat has ample storage space for its size. It is also provided with rope/anchor boxes both fore and aft. 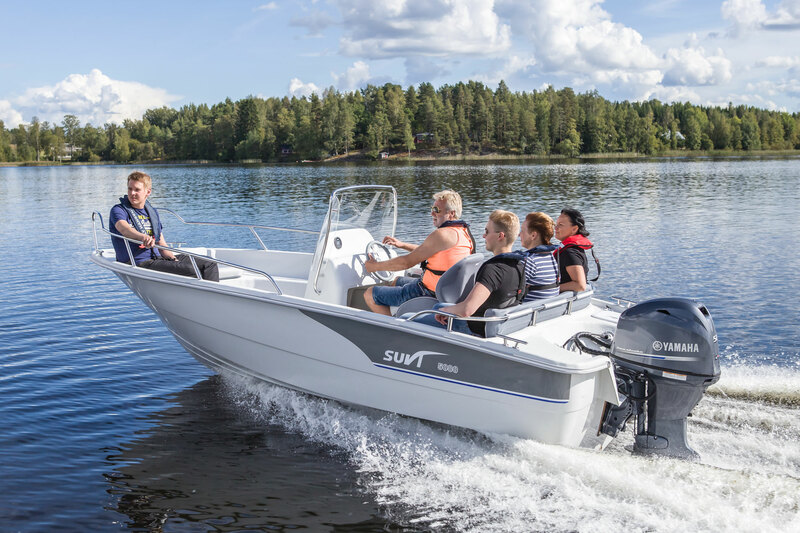 The maximum recommended engine power is 30 hp, which provides a speed of about 26 knots with a load of 1 person and about 23 knots with a load of 4 persons. fishing use. 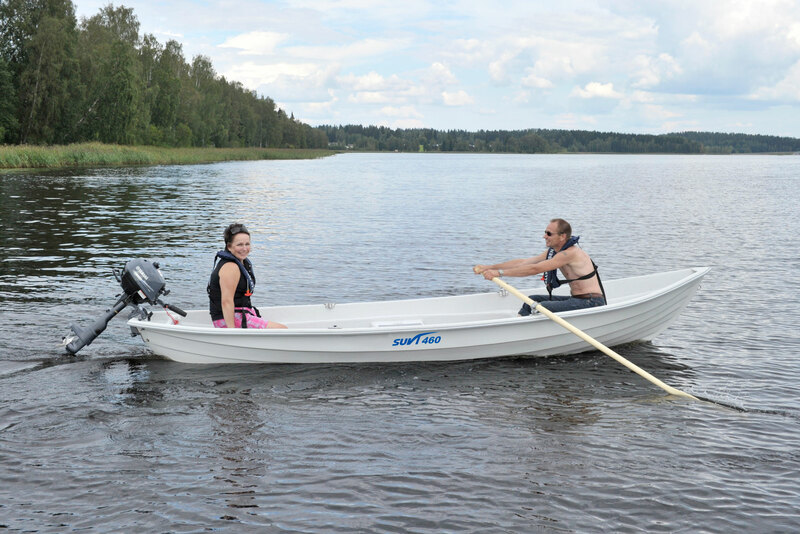 The boat can also be rowed. For a long shaft outboard engine. 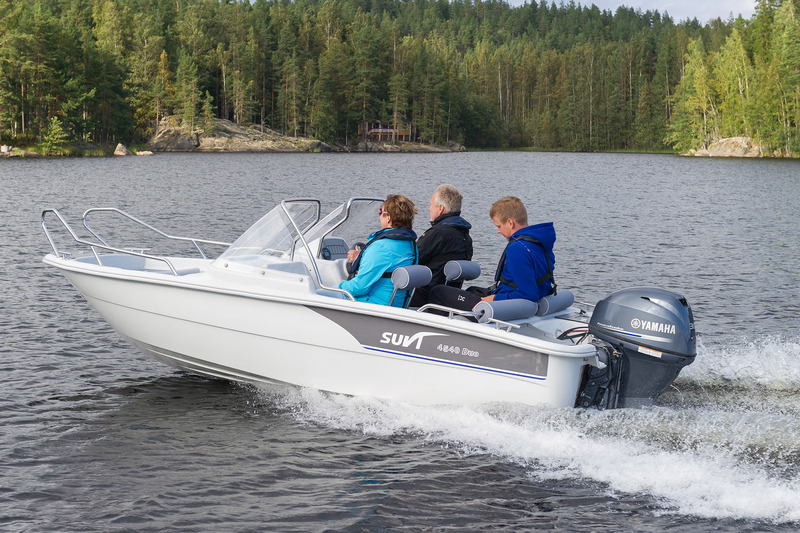 The Suvi 4230 R is a steering console boat ideal for use at the summer cottage and when fishing. 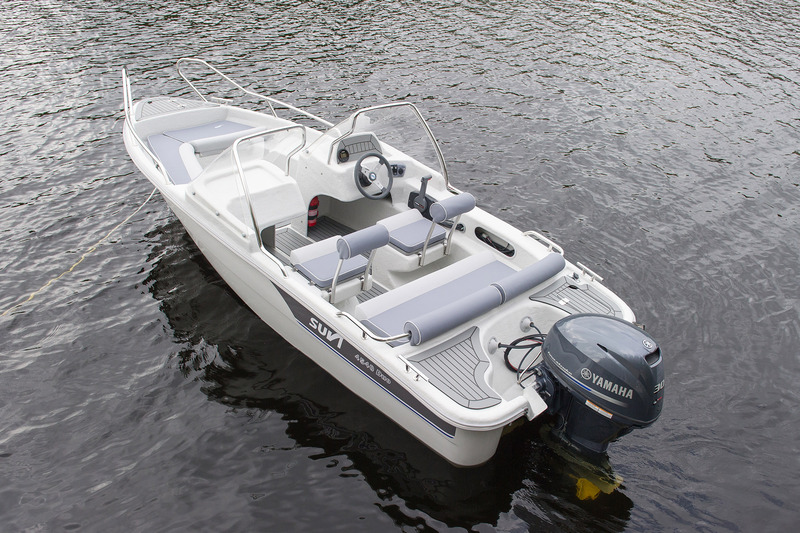 Due to its greater breadth at the waterline, the 4230 is more stable relative to its size. 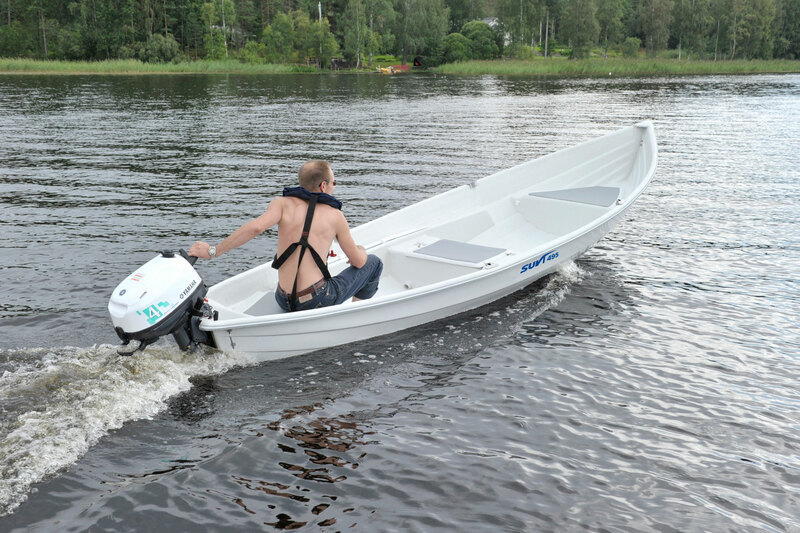 The recommended engine power is 20 hp, enough to carry a load of three persons (at 85 kg each). 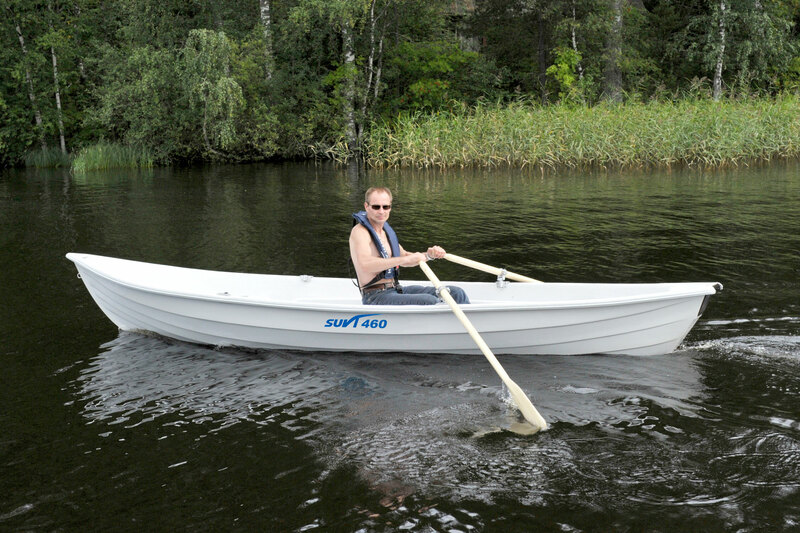 The boat can also be rowed. 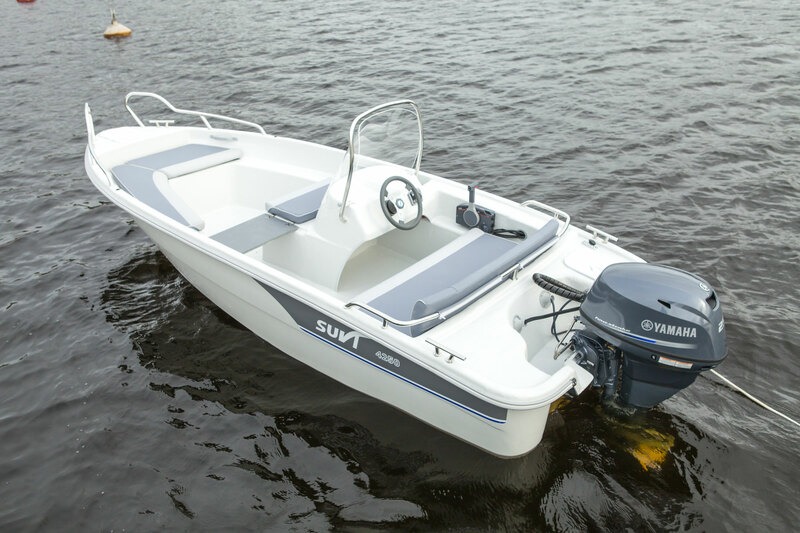 For a long-shaft or short-shaft outboard engine. 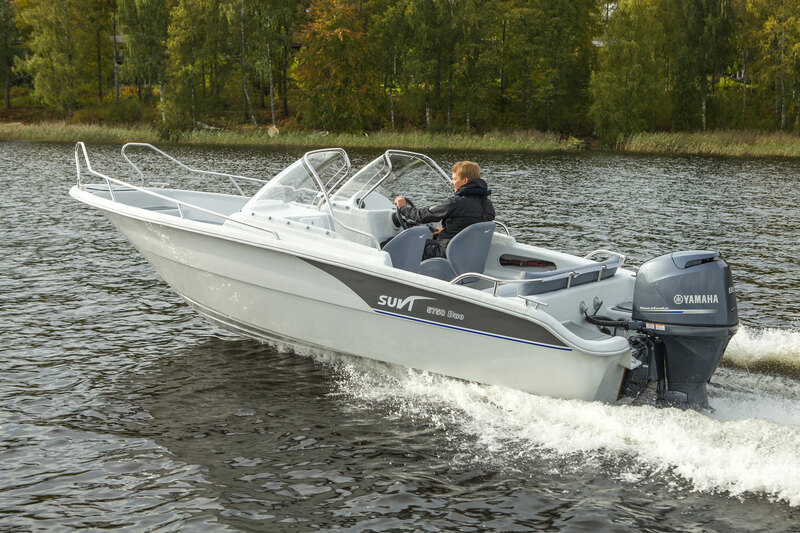 Also available without steering console (Suvi 4230 MV). 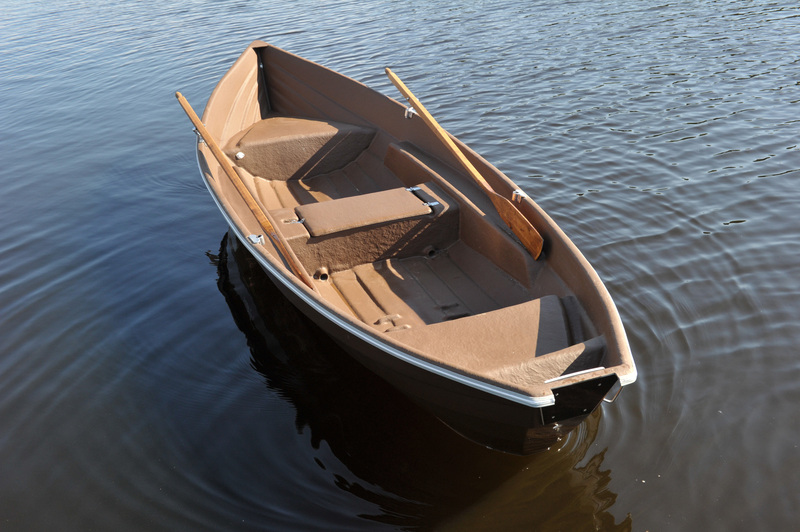 A planing-hulled, flat transom model for a ten horsepower engine. 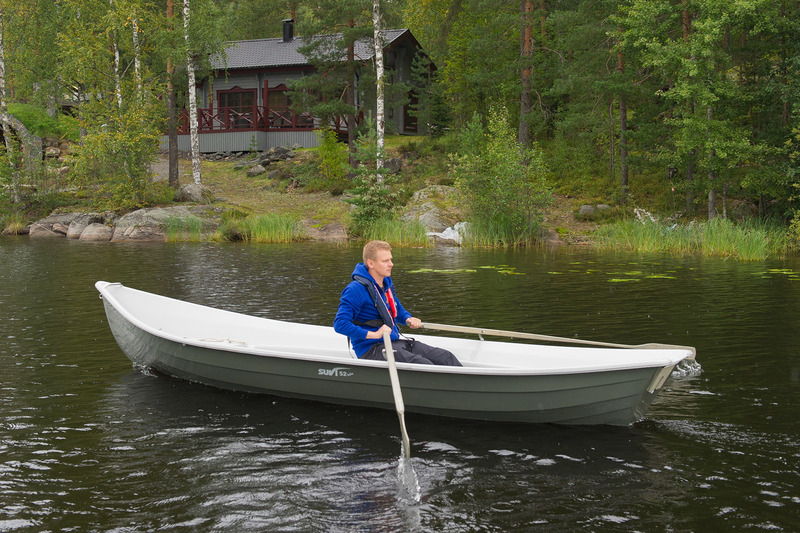 A wider, stable summer cottage and fishing boat. For a short shaft engine. 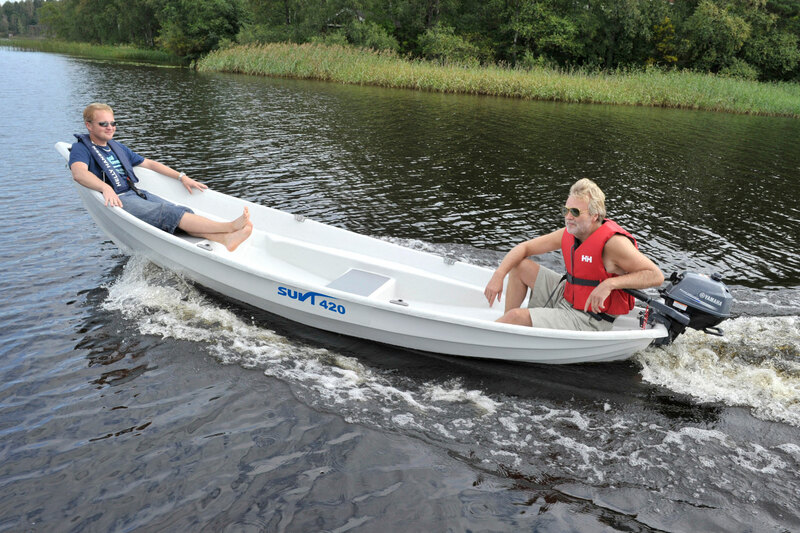 The boat can also be rowed. 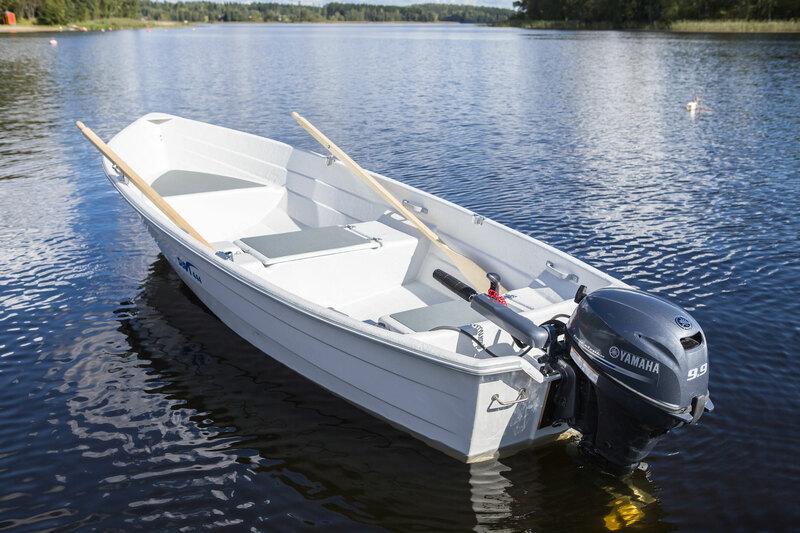 A new row/motorboat with a wider water line and more buoyancy for summer cottage and fishing use. 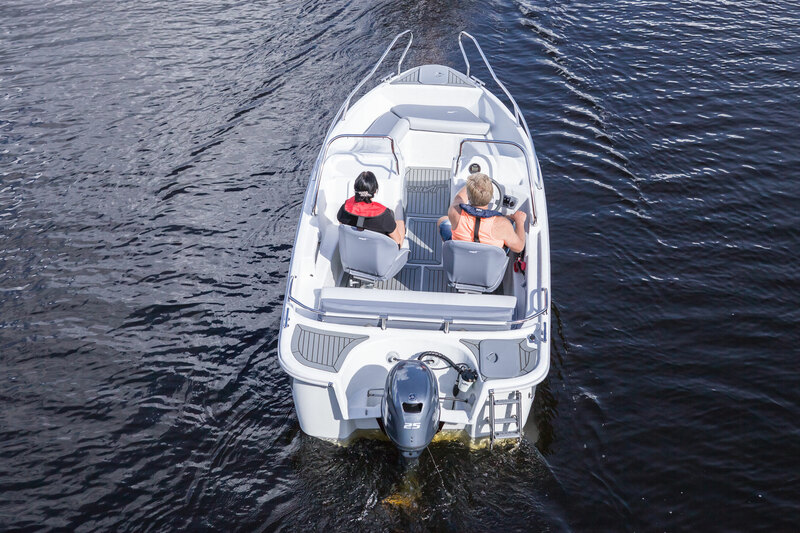 Thanks to the new bottom design and a wider water line, the maximum engine recommendation has been increased to ten horsepower. 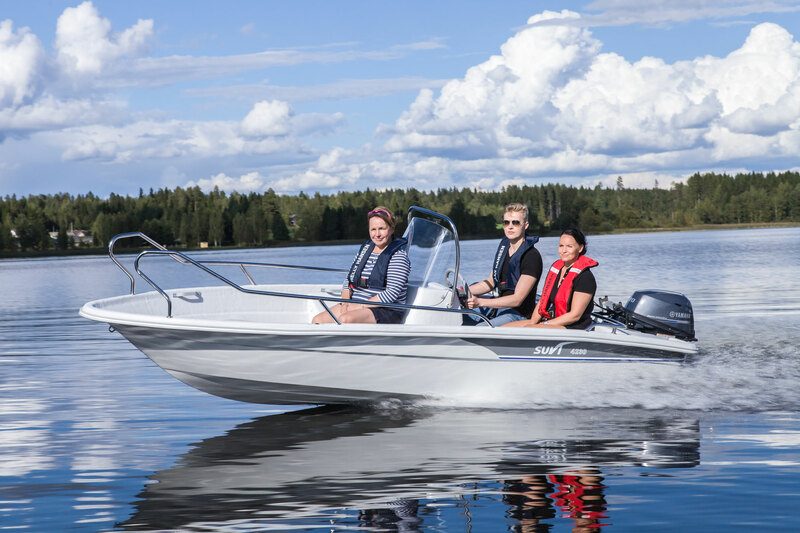 The boat planes better than its predecessor and can reach a speed of up to 19 knots with a load of one person, still managing 18 knots with two people on board. The most recommended engine power is four to ten horsepower. 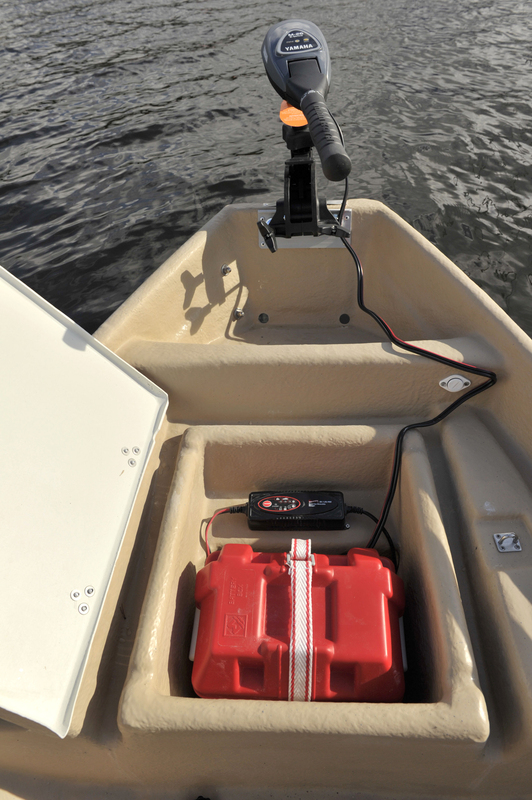 A keeled row and motor boat that rises to plane already on 4 hp. Two lockable storage compartments. 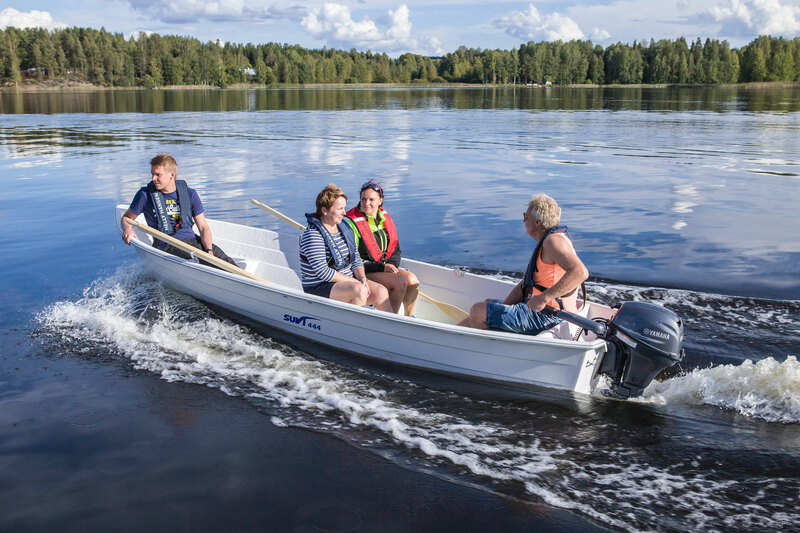 An excellent summer cottage boat for smaller waters. For a short shaft engine. 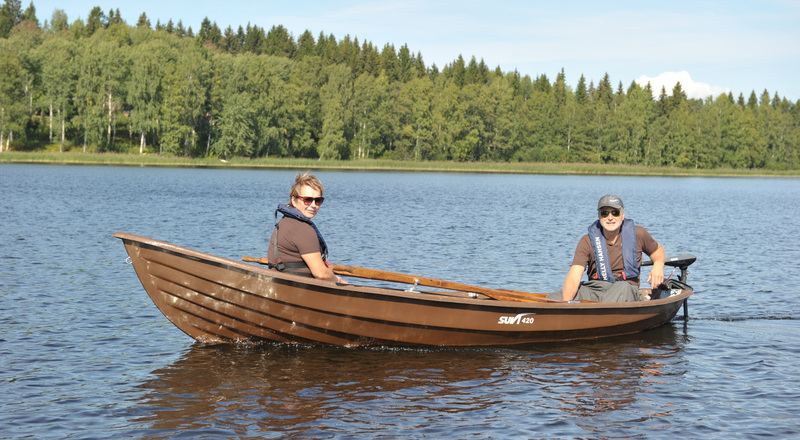 The new “Terva” rowing boats are dark brown in colour, as the name suggests – terva is Finnish for “tar”. 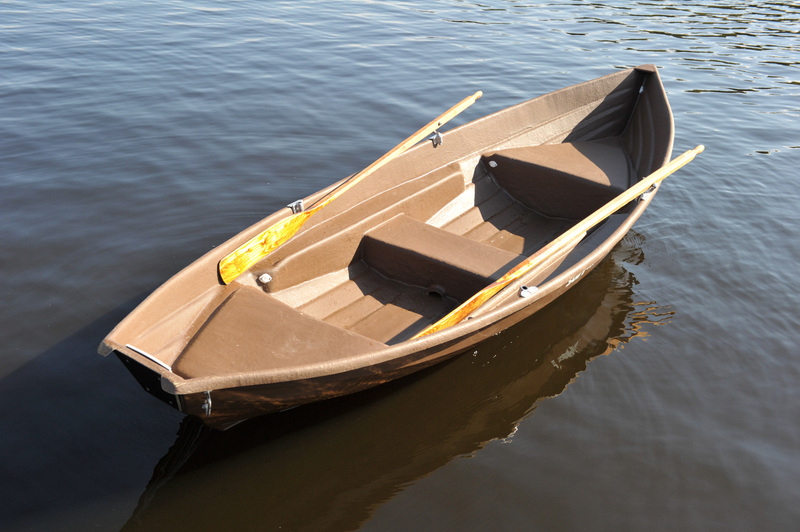 They provide a nice alternative to pale-coloured boats. The colour is a great fit in Nordic nature. 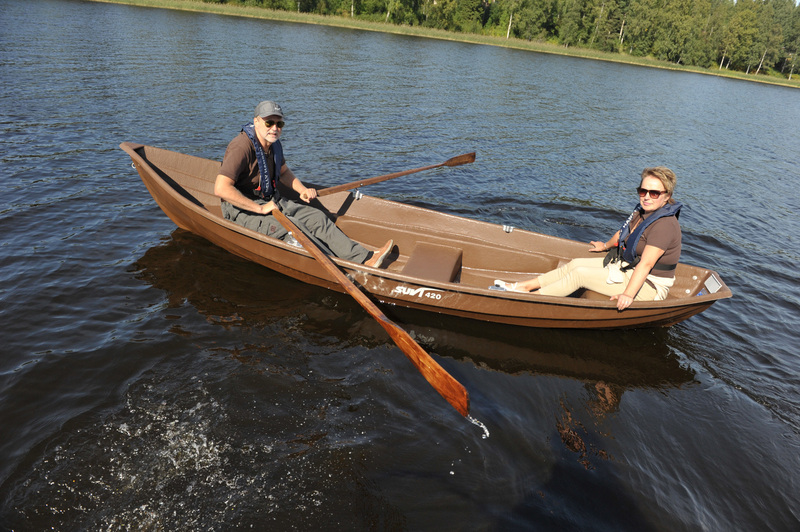 Surface-treated or tar-coated oars with curved blades come as standard. 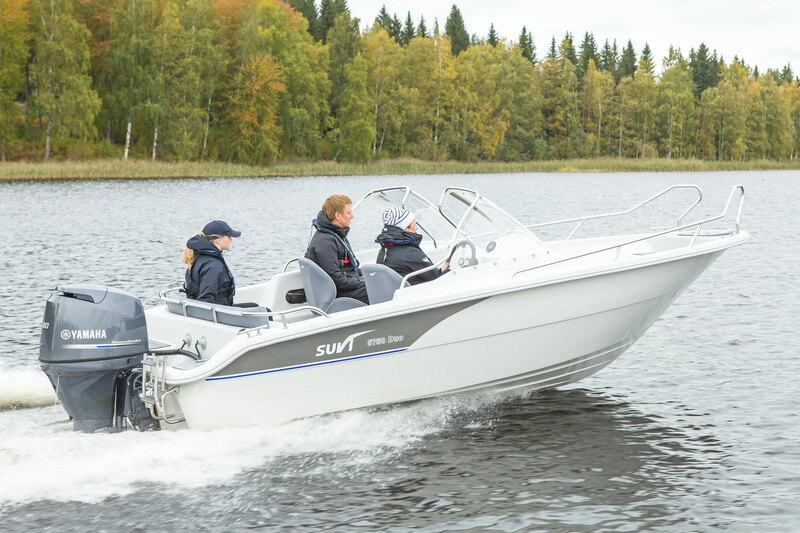 Thanks to its hull bottom design, the SUVI 495 “Terva” can also be powered with an outboard. 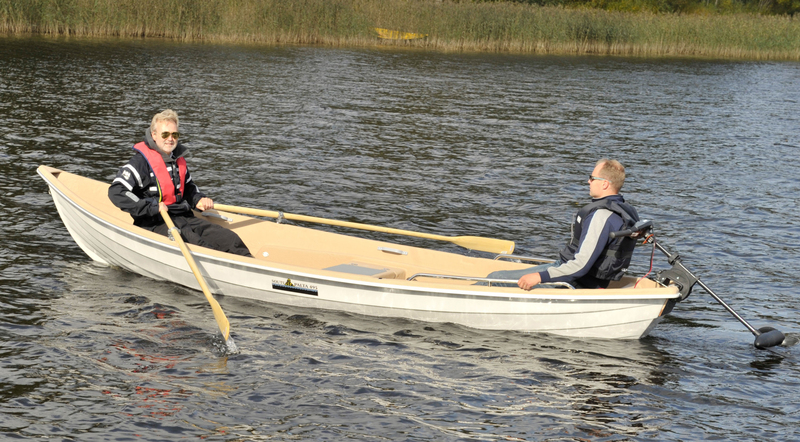 However, its excellent rowing characteristics have not been compromised, and its lateral stability has been improved. 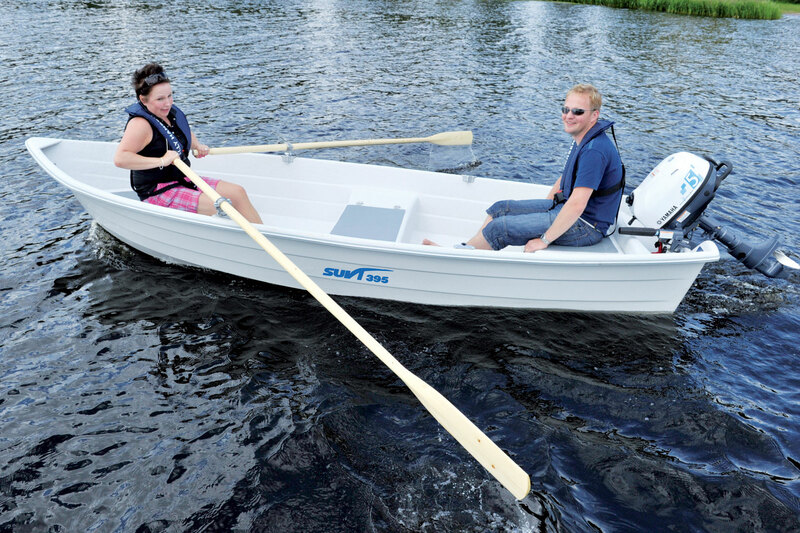 It is a very large and stable rowing boat for use at the cabin, including fishing. 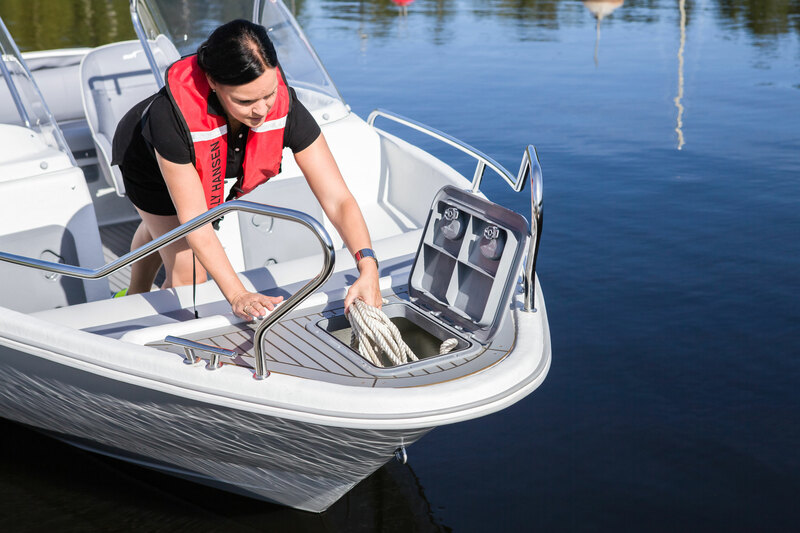 The boat features an engine well which facilitates outboard use, plus a lockable storage compartment and an aluminium edging strip. 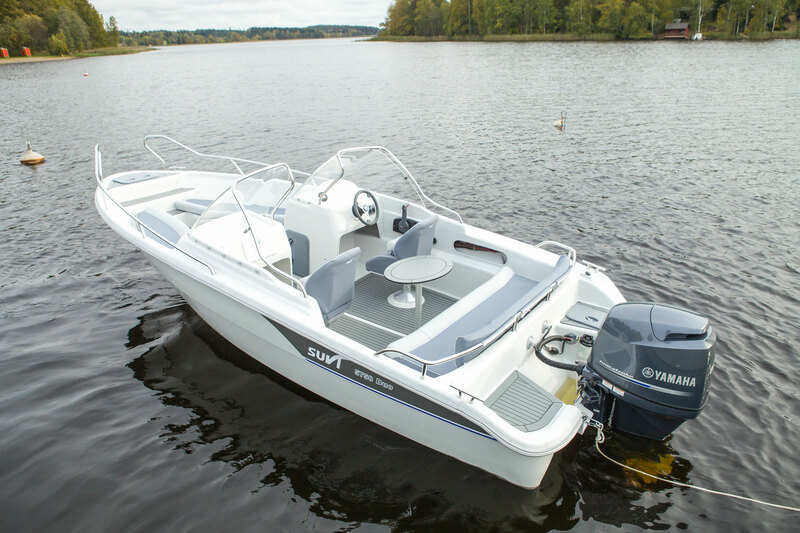 The boat has been designed for short-shaft outboards. 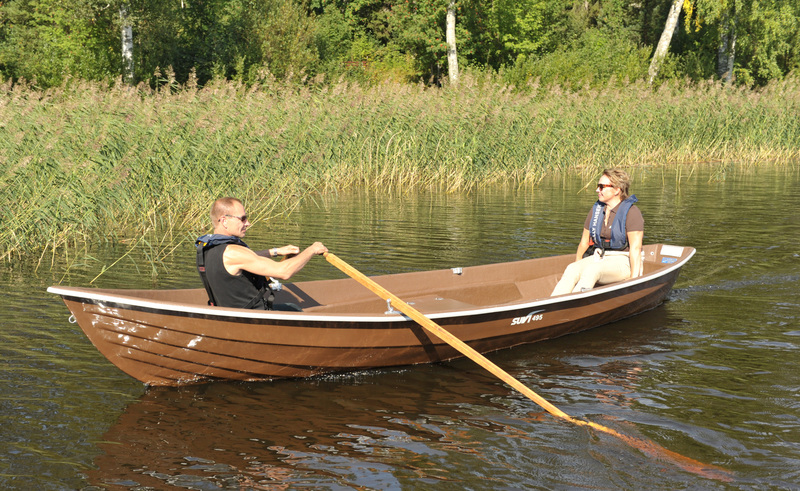 The new “Terva” rowing boats are dark brown in colour, as the name suggests – terva is Finnish for “tar”. 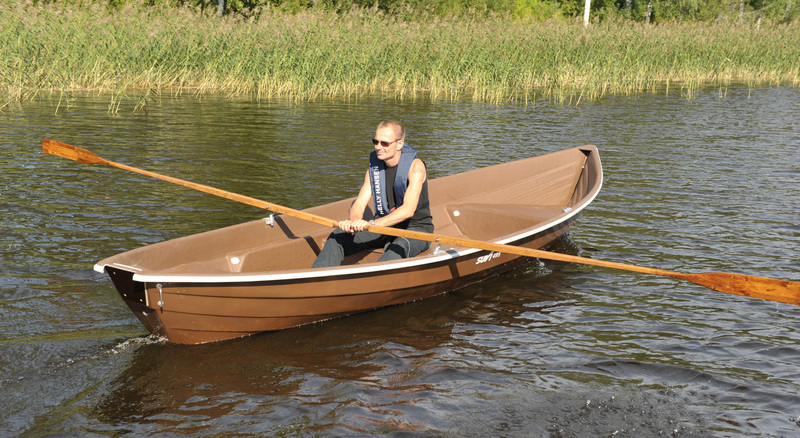 They provide a nice alternative to pale-coloured boats. The colour is a great fit in Nordic nature. 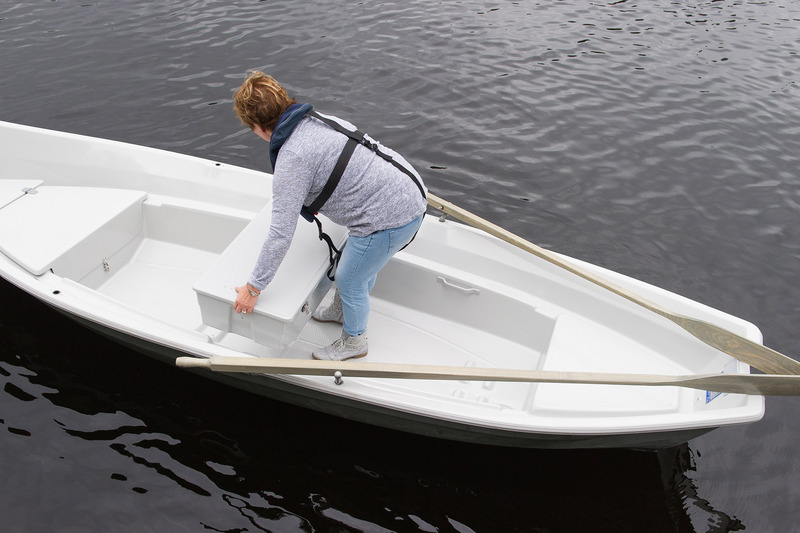 Surface-treated or tar-coated oars with curved blades come as standard. 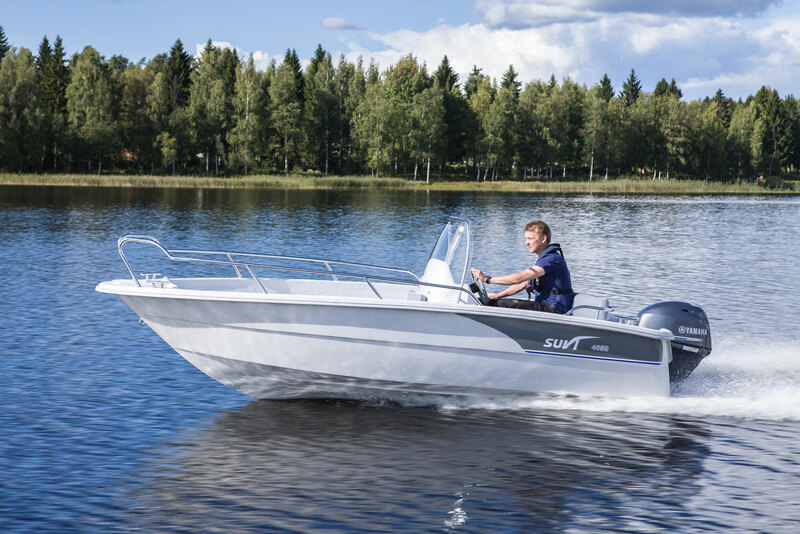 Thanks to its hull bottom design, the SUVI 460 “Terva” can also be powered with an outboard. 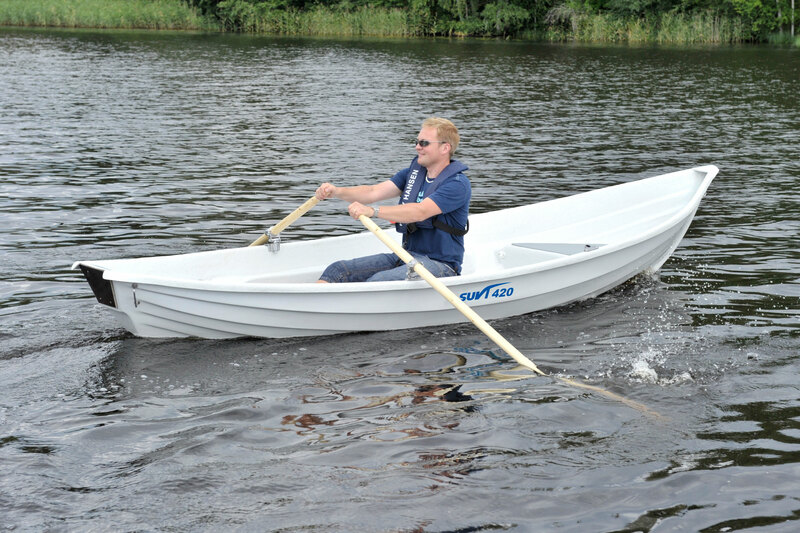 However, its excellent rowing characteristics have not been compromised, and its lateral stability has been improved. 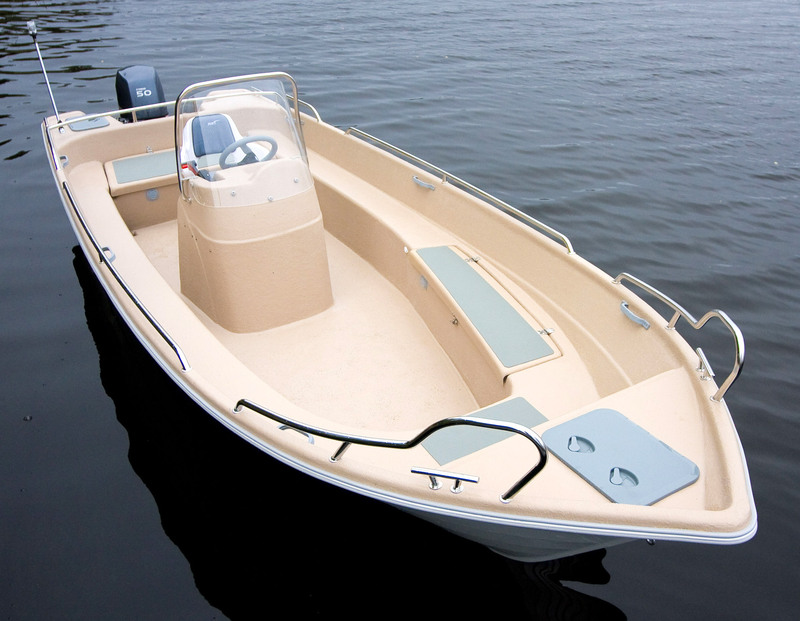 It is a safe and buoyant boat that is well suited for use at the cabin, including fishing. The engine well and the aluminium edging strip come as standard, and there is a lockable storage compartment within the middle seat. 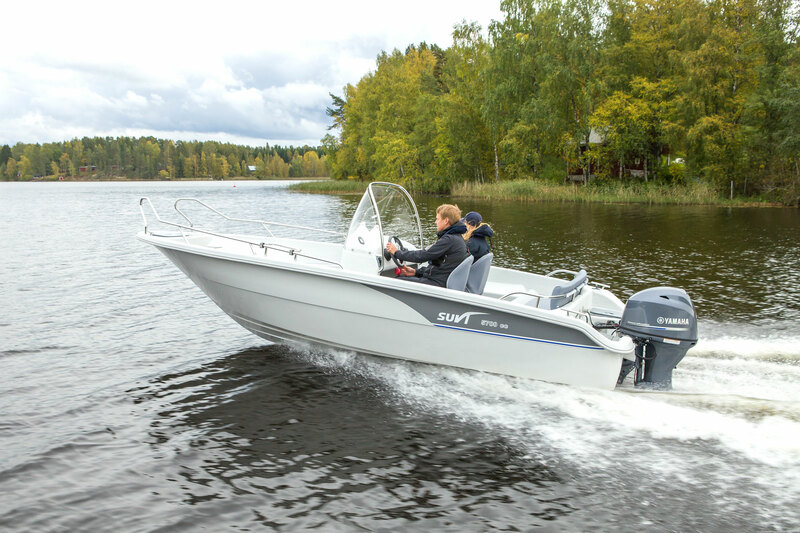 The boat has been designed for short-shaft outboards. 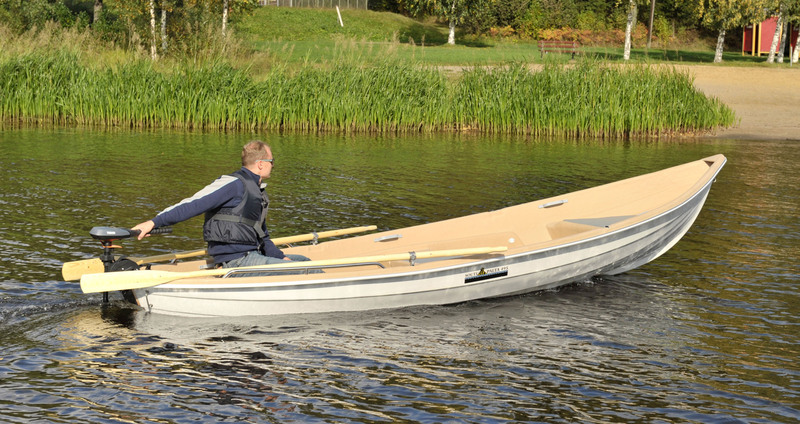 The new “Terva” rowing boats are dark brown in colour, as the name suggests – terva is Finnish for “tar”. 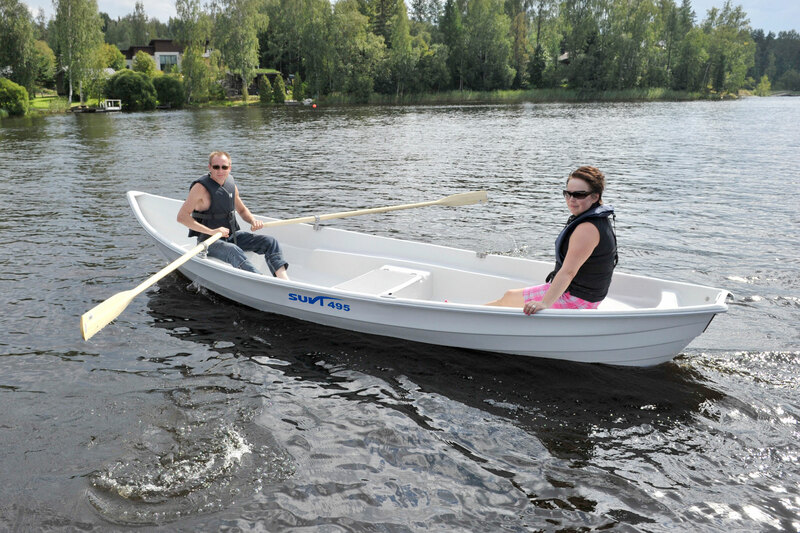 They provide a nice alternative to pale-coloured boats. The colour is a great fit in Nordic nature. 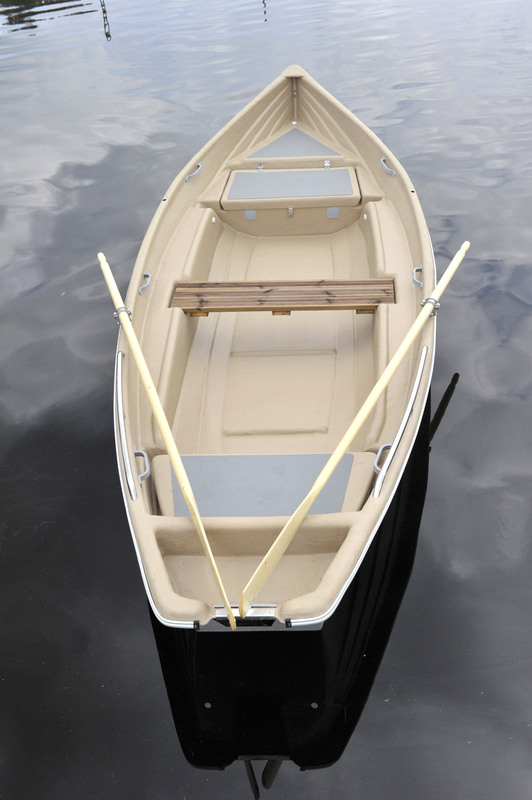 Surface-treated or tar-coated oars with curved blades come as standard. 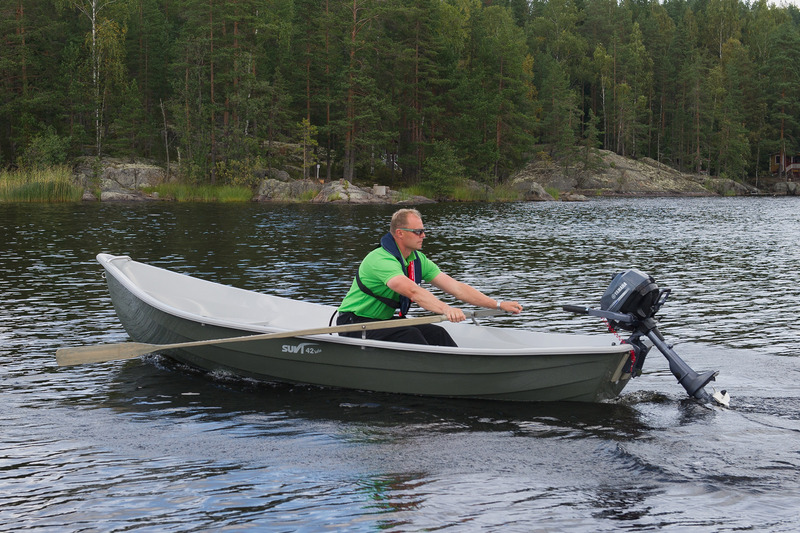 The SUVI 420 “Terva” is a lightweight rowing boat that is well suited for use at the cabin, including fishing. The boat is safe and buoyant and very light to row. 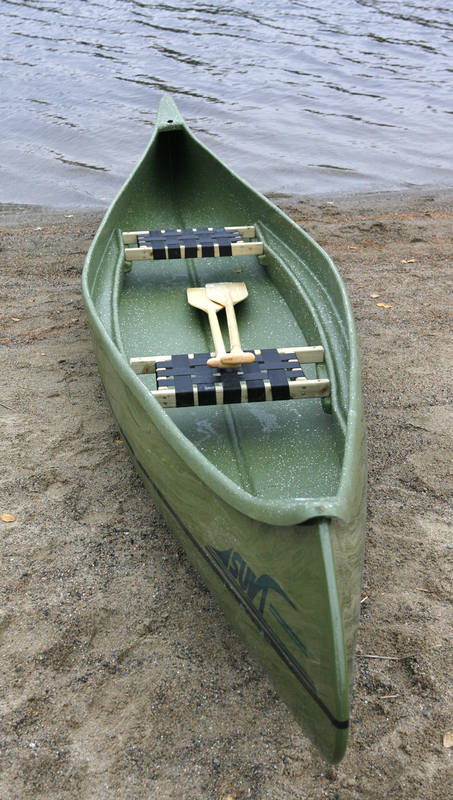 The keel is made out of a sand-resin mixture. 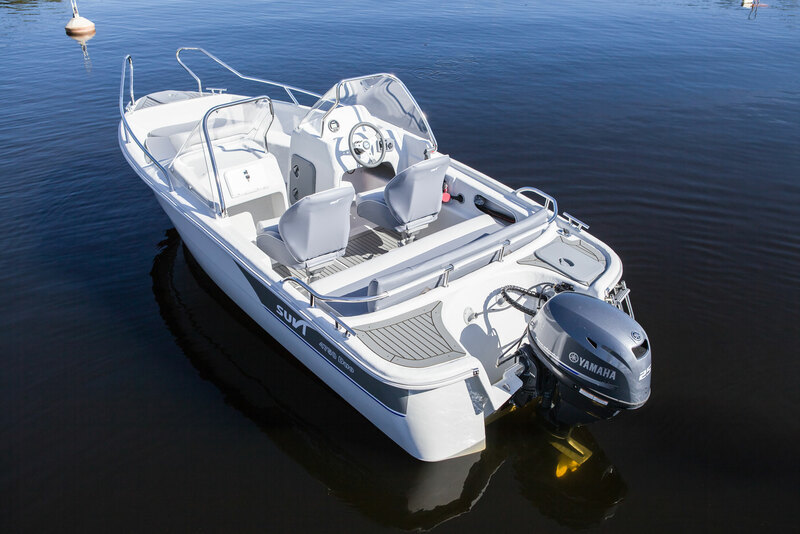 It has been designed for short-shaft outboards. 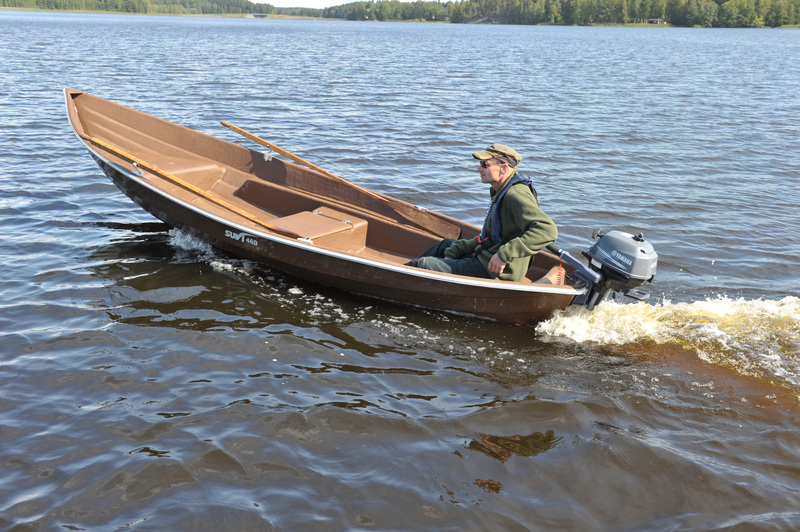 An extremely stable, safe and unsinkable rowboat for summer cottage and fishing use. 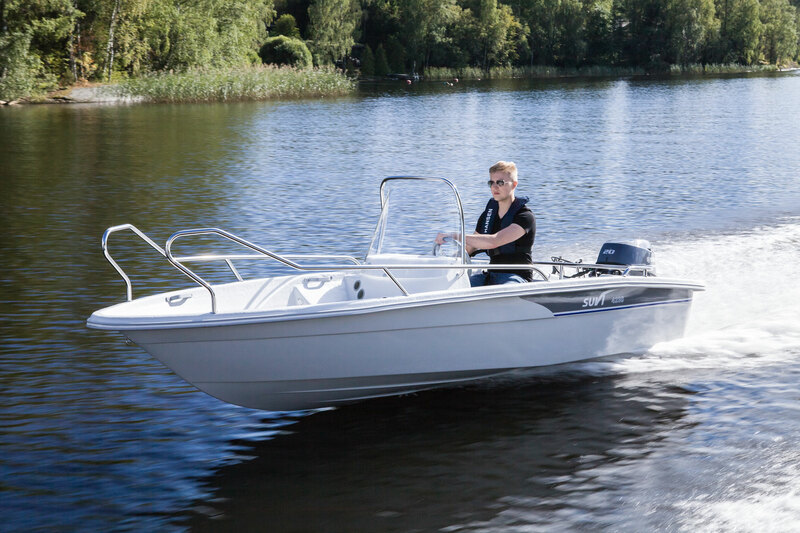 The hull design guarantees better handling characteristics while using an engine. 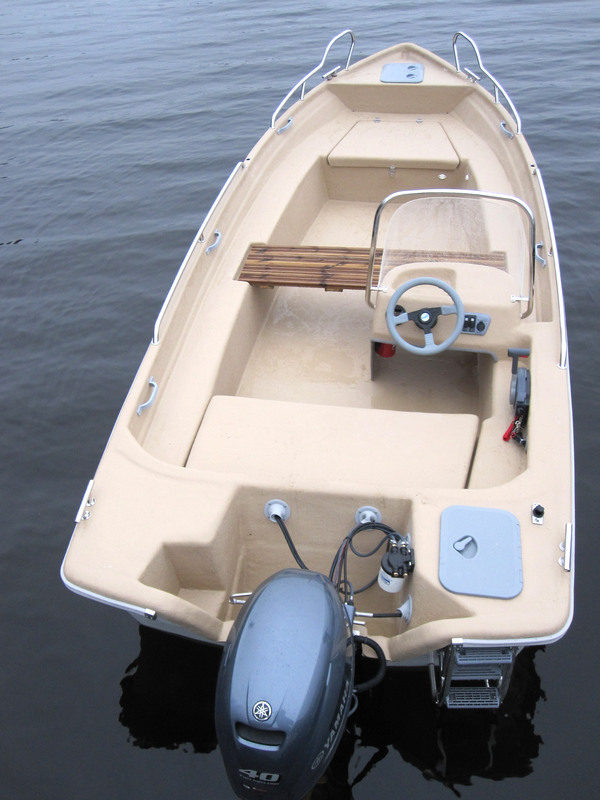 The boat has a locking stowage space and an engine well to facilitate driving with an engine. For a short shaft engine. 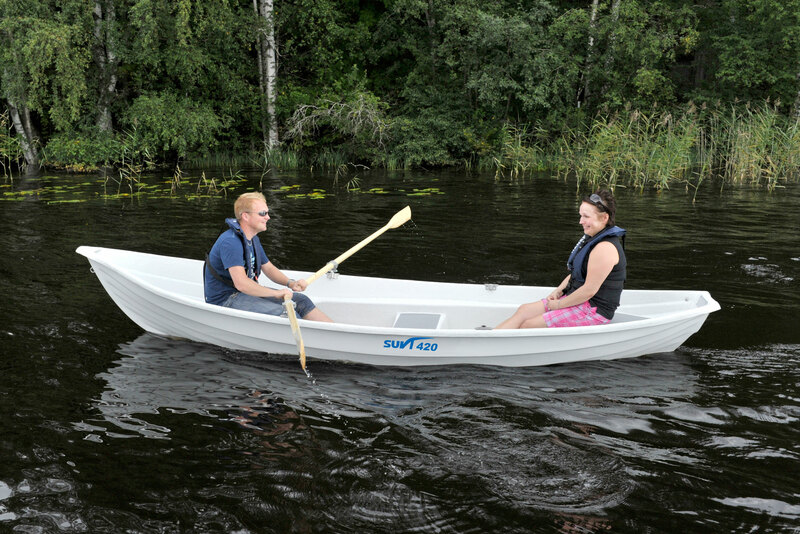 The Suvi 460 is a traditional rowboat in the Savonian tradition, equipped with a resin sand keel. 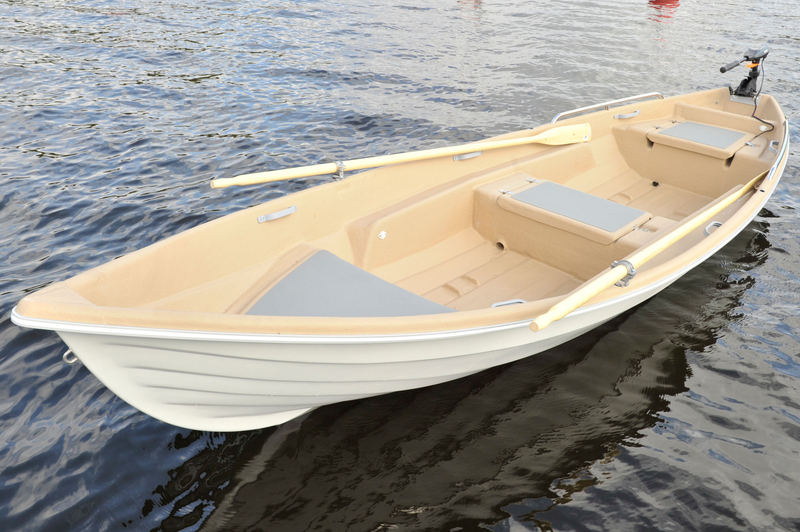 A safe, unsinkable boat or summer cottage and fishing use. 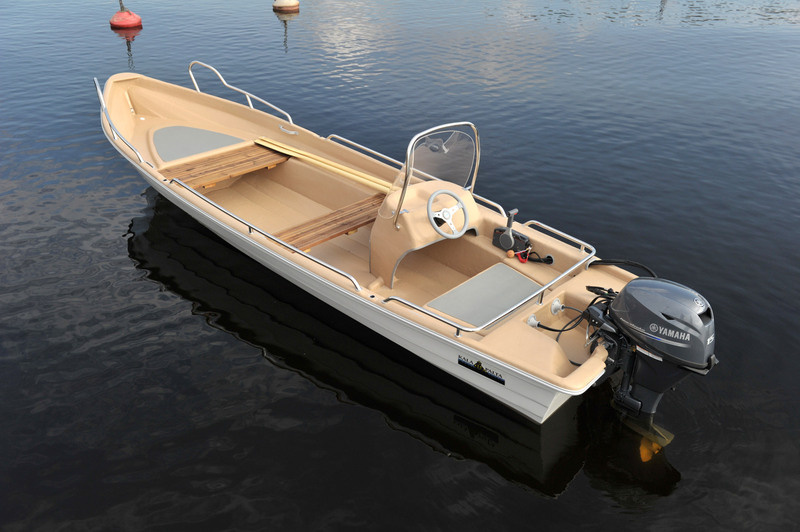 The hull design guarantees better handling characteristics while using an engine. Light to row even for longer distances. Locking stowage space in the center seat. For a short shaft engine. 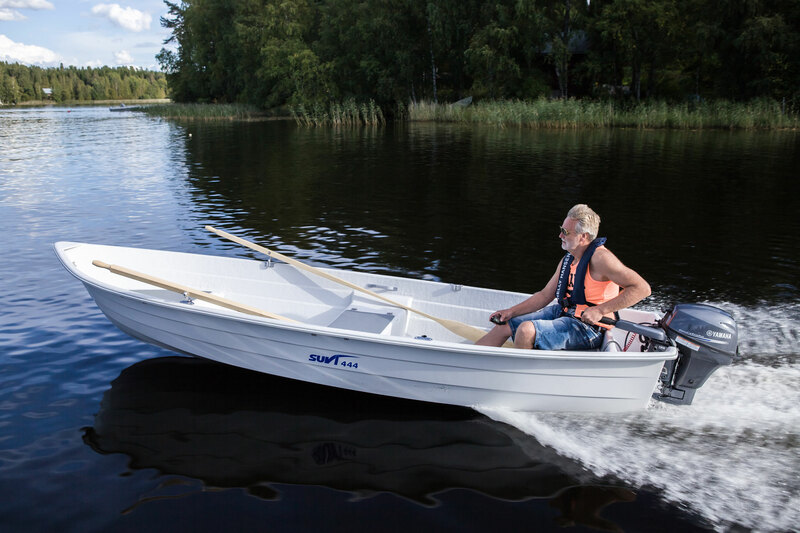 The Suvi 420 is a lighter rowboat in the Savonian tradition for summer cottage and fishing use. 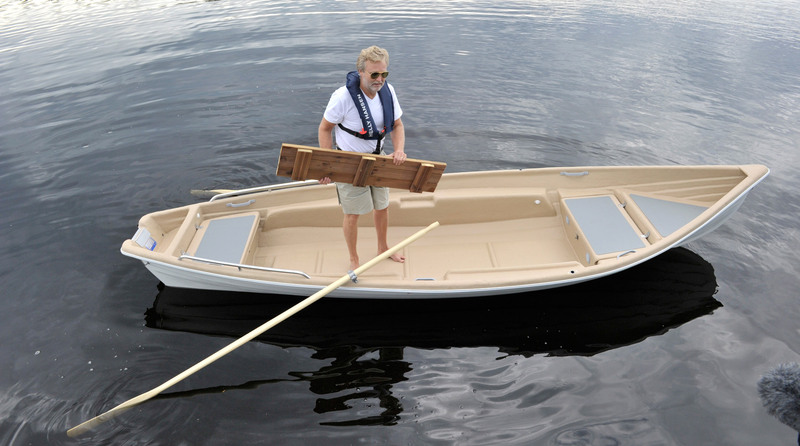 Safe, unsinkable, equipped with resin sand keel. Extremely light to row. For a short shaft engine. 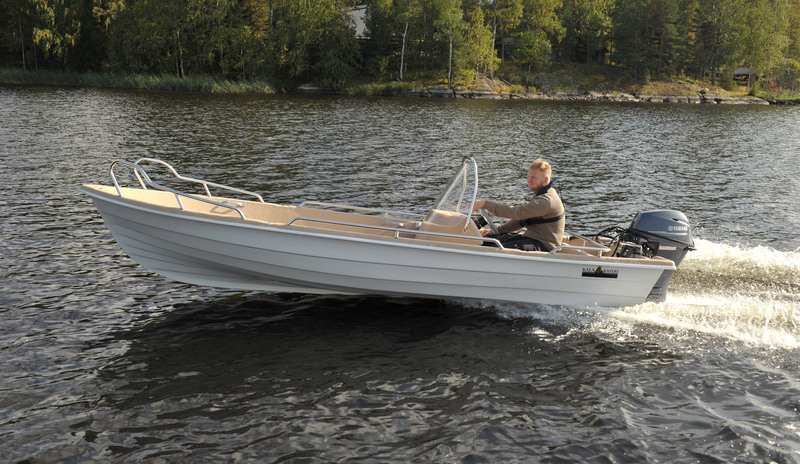 Suvi 52 "kelo" is a versatile big keeled boat for the summer house. 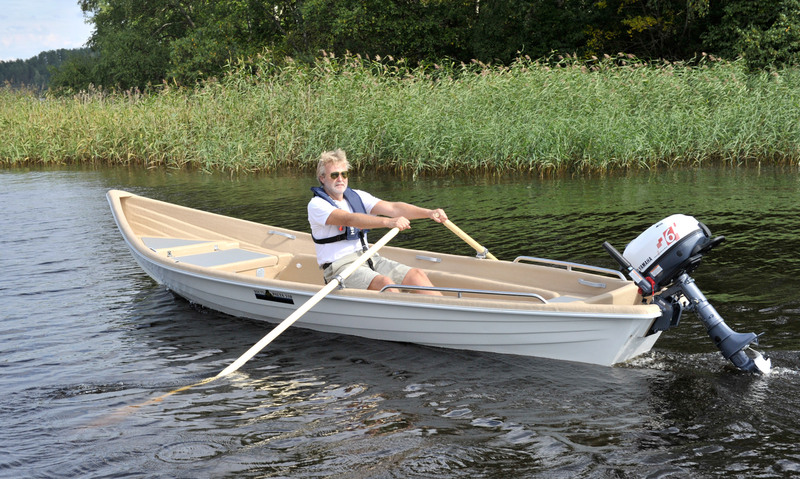 It is light to row for its size and runs excellently with an engine. 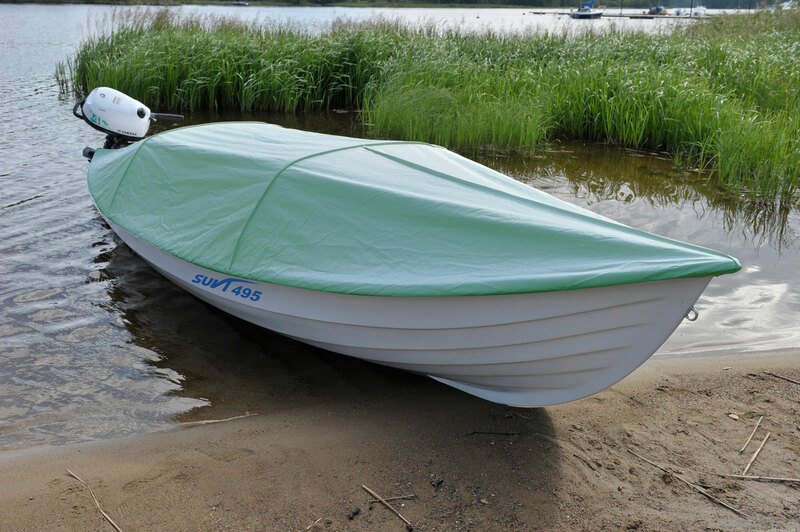 The boats are available in new colours that are in perfect harmony with the nature. 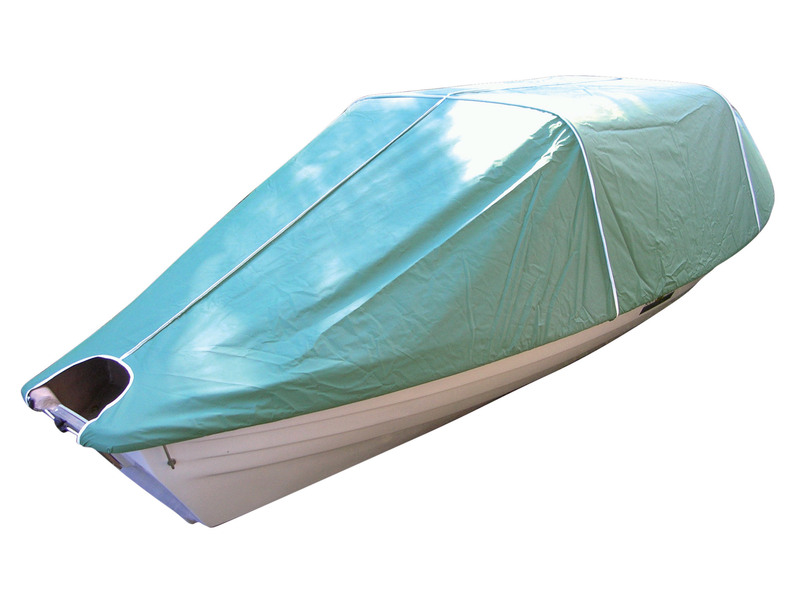 The boat has a two-shell construction with air between the shells. The floor and seating areas are rough-textured to provide a non-slip surface. Two lockable storage compartments, of which the middle seat also serves as a detachable storage box. 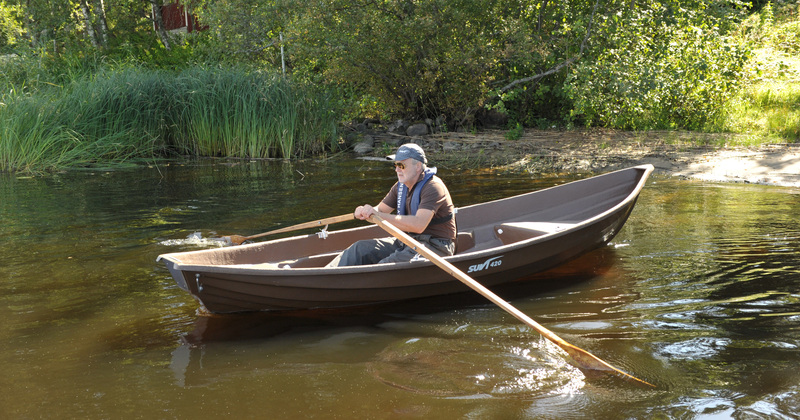 The oars provided as standard equipment have curved blades, and their grey colour matches with the boat's weathered kelo wood colour. The recommended engine power for 52 "kelo" is max. 5 hp. For a short shaft engine. 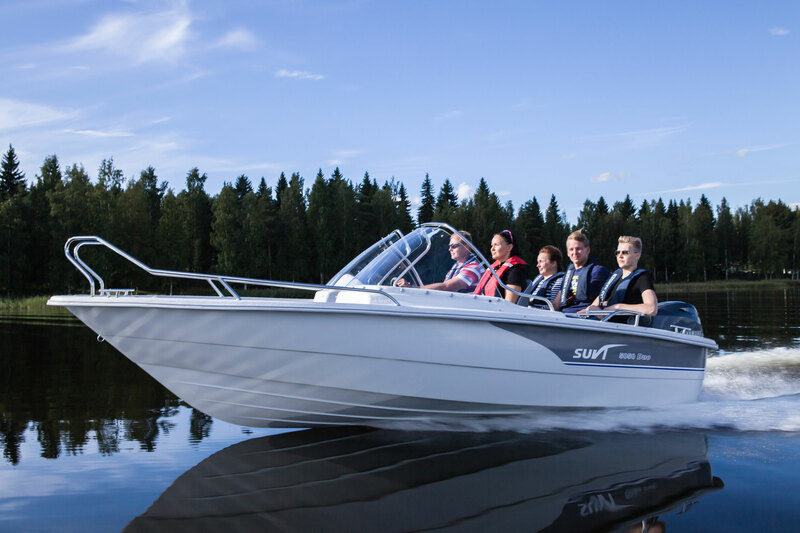 Suvi 52 "kelo" has been type-approved for 4 passengers in accordance with the new Recreational Craft Directive which will enter into force in 2017. 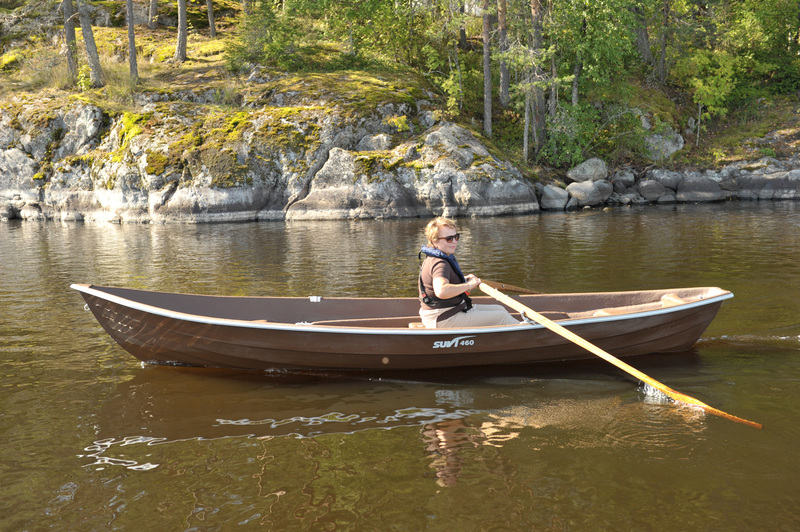 Suvi 42 ”kelo” is a keeled rowing boat in the Savonian tradition for fishing and for use at the summer house. 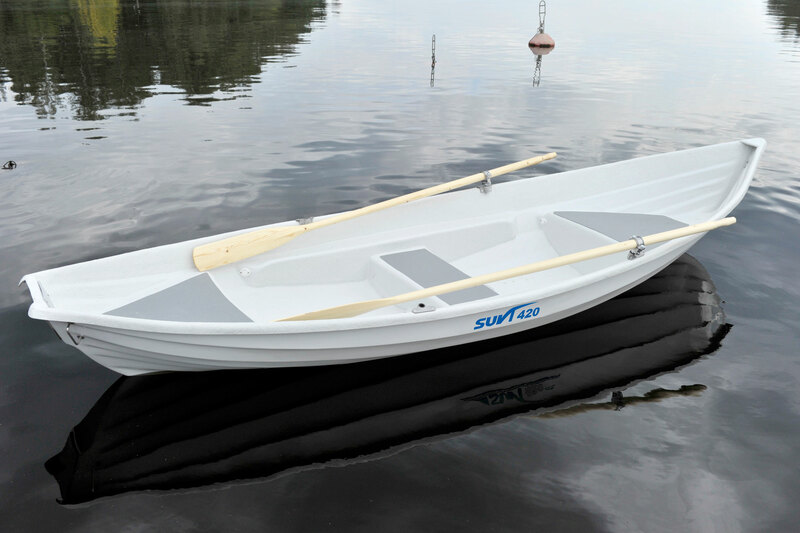 It is light to row and also runs with an engine. 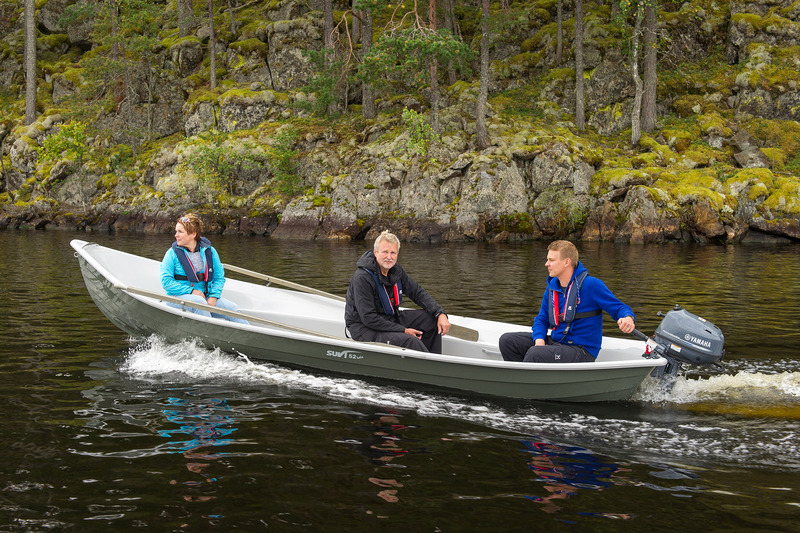 The boats are available in new colours that are in perfect harmony with the nature. 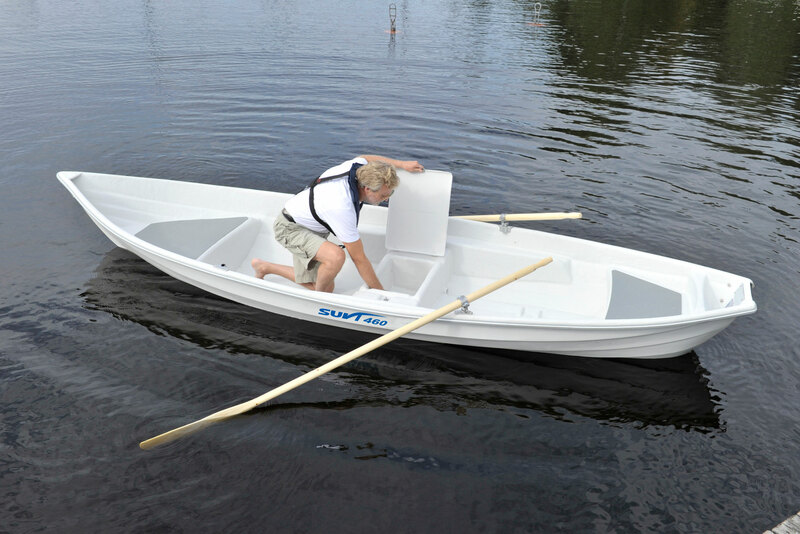 The boat has a two-shell construction with air between the shells. The floor and seating areas are rough-textured to provide a non-slip surface. Two lockable storage compartments, of which the middle seat also serves as a detachable storage box. 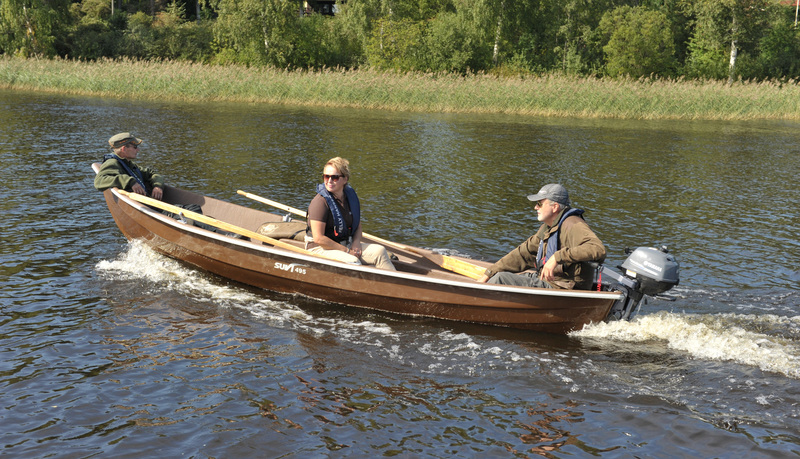 The oars provided as standard equipment have curved blades, and their grey colour matches with the boat's weathered kelo wood colour. The recommended engine power for 42 "kelo" is max. 2.5 hp. For a short shaft engine. 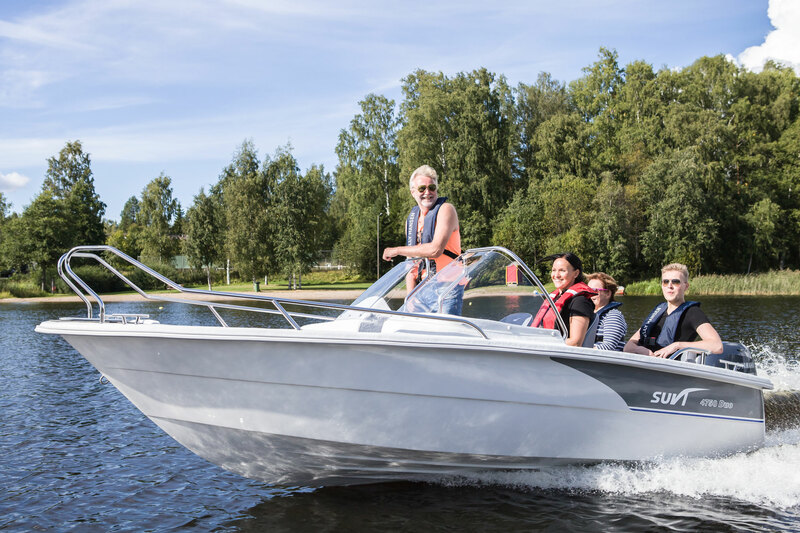 Suvi 42 "kelo" has been type-approved for 3 passengers in accordance with the new Recreational Craft Directive which will enter into force in 2017. 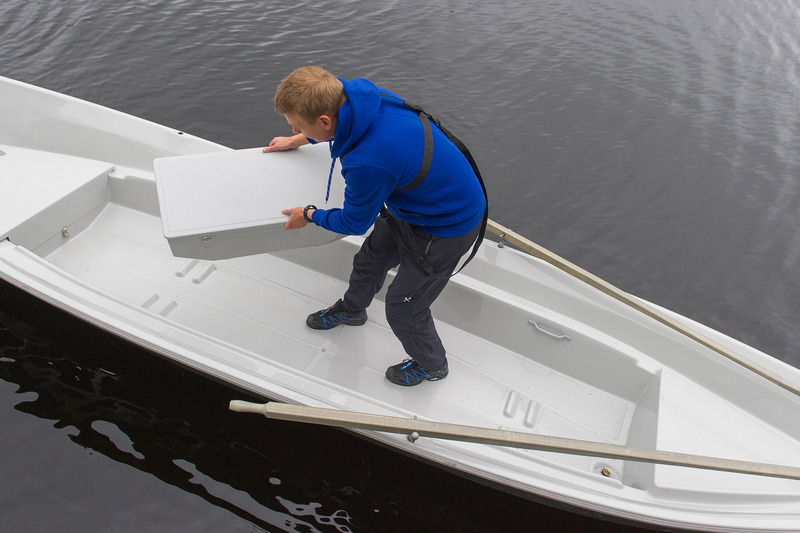 A handy auxiliary for larger boats, or you can bring it along on the roof of your car. For a short shaft engine. 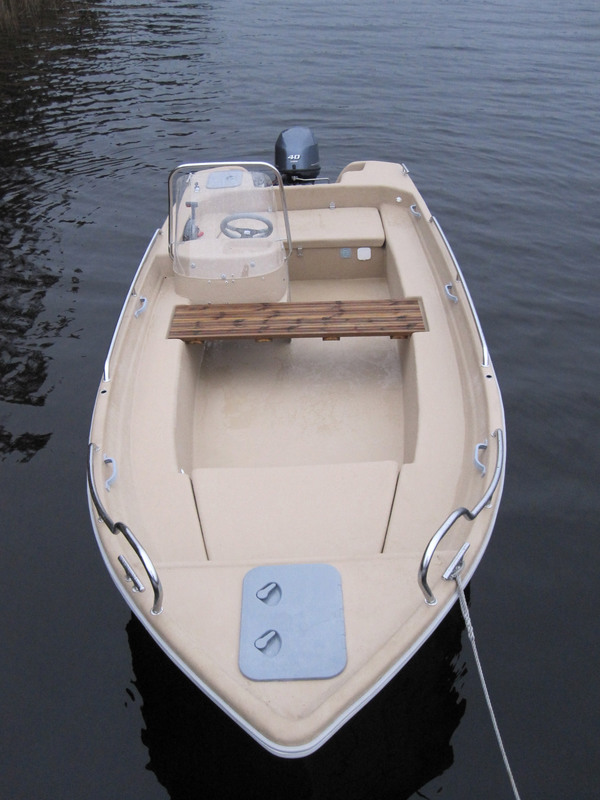 A self-draining model with center console, equipped with a driver’s seat with pedestal. 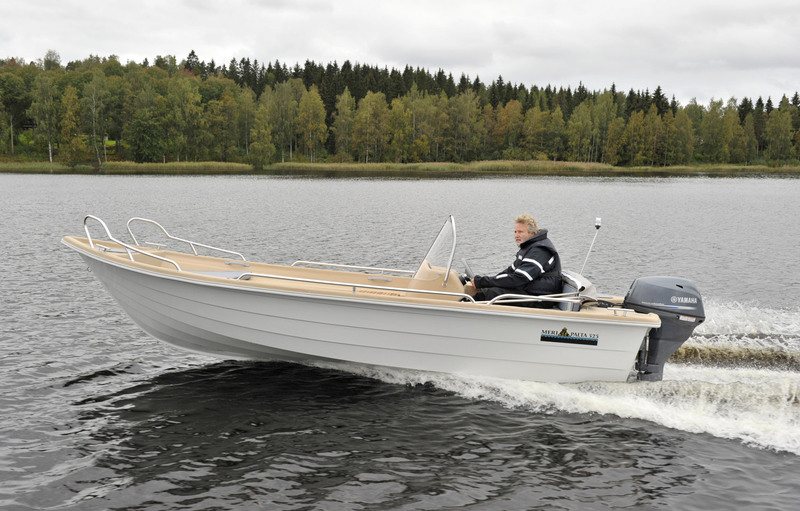 An excellent model for fishing or transport in the archipelago or on larger lakes. Plenty of space for e.g. fishing. 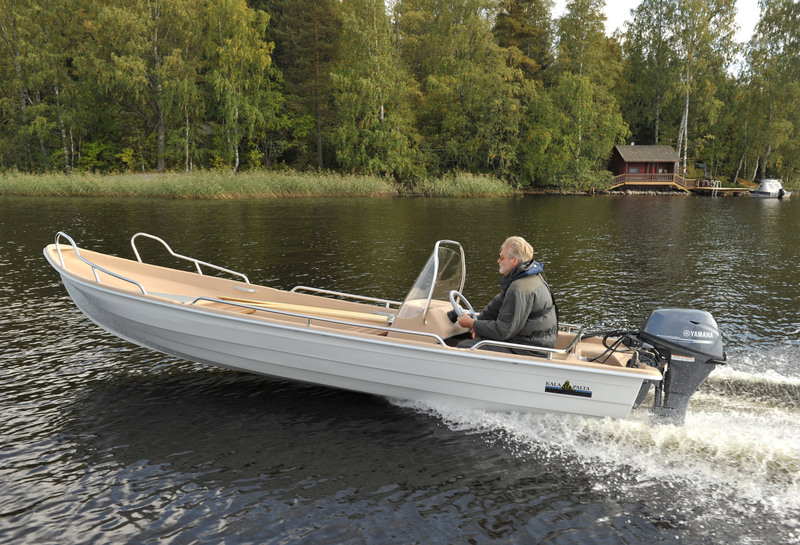 The boat has practically no plane threshold, so driving at different speeds is easy. The recommended engine is 40–50 hp. For a long shaft outboard engine. Meri-Palta 525 is new self draining model to popular Palta collection. 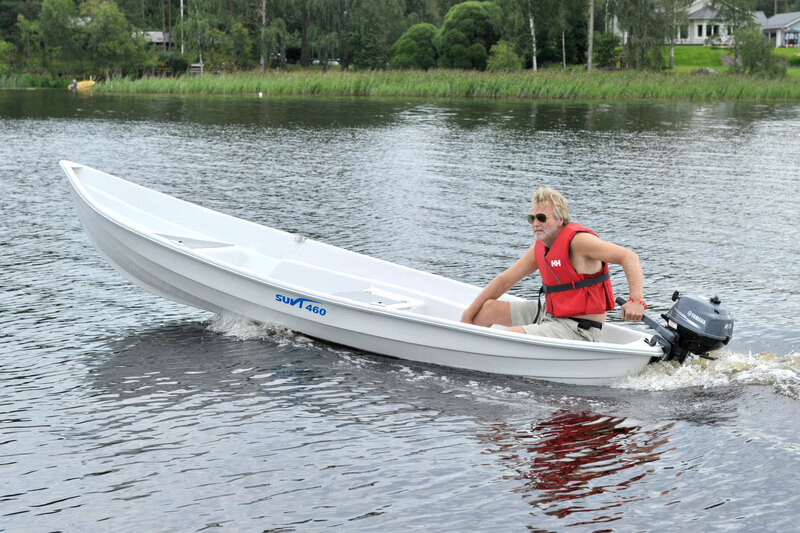 Ideal model for summer cottage use and fishing. In the size of Meri-Palta 525 is set between bigger Meri-Palta cc and smaller Kala-Palta models. 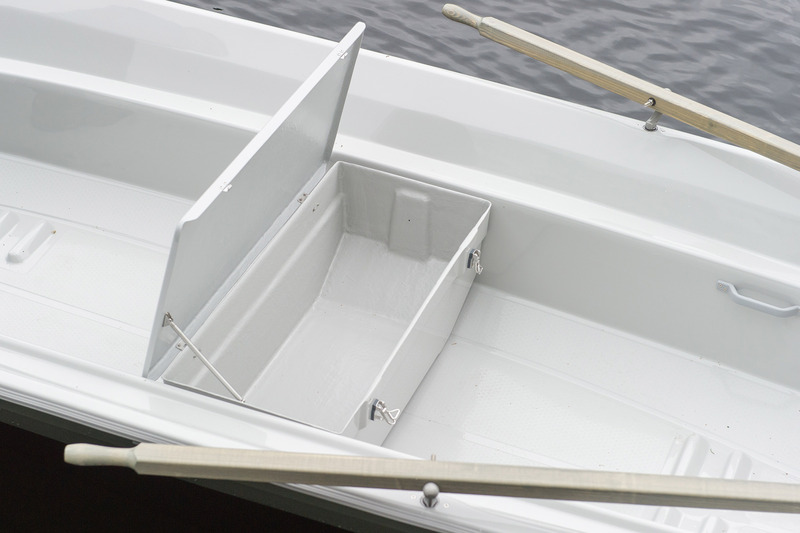 The boat has two locking stowage spaces and two rope/anchor boxes. Plenty of space for e.g. fishing. The recommended engine is 25 hp. For a long shaft outboard engine. A great favourite of net fishers. An extremely stable model equipped with a high keel. 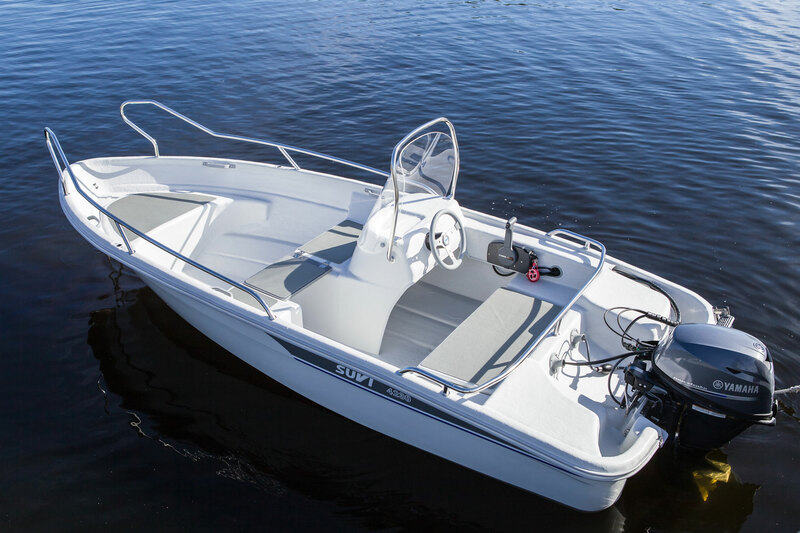 The boat has a large, open interior space and a strongly raised bow, which makes fishing possible in rough weather as well. Also available with fixed steering console and optional accessories. 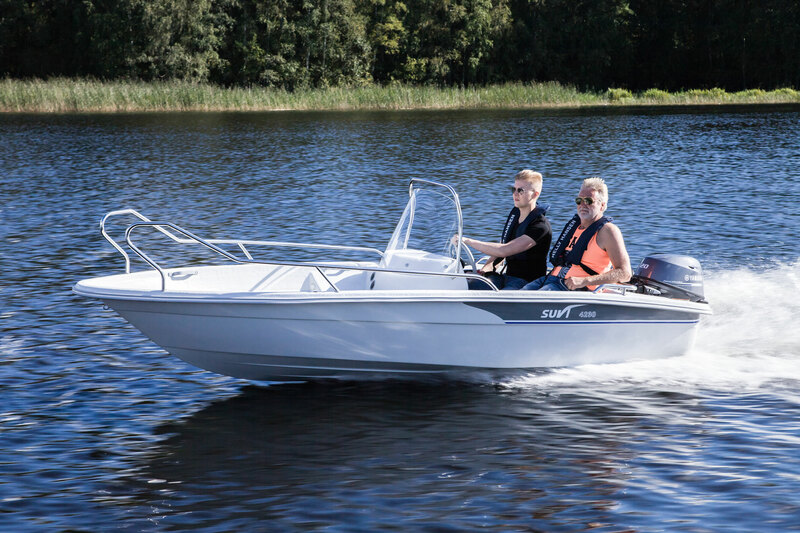 You can choose either the basic boat (Kala-Palta MV) or one with fixed steering console (Kala-Palta R) and optional accessories, according to your need. Two different models. For a short or long shaft engine. 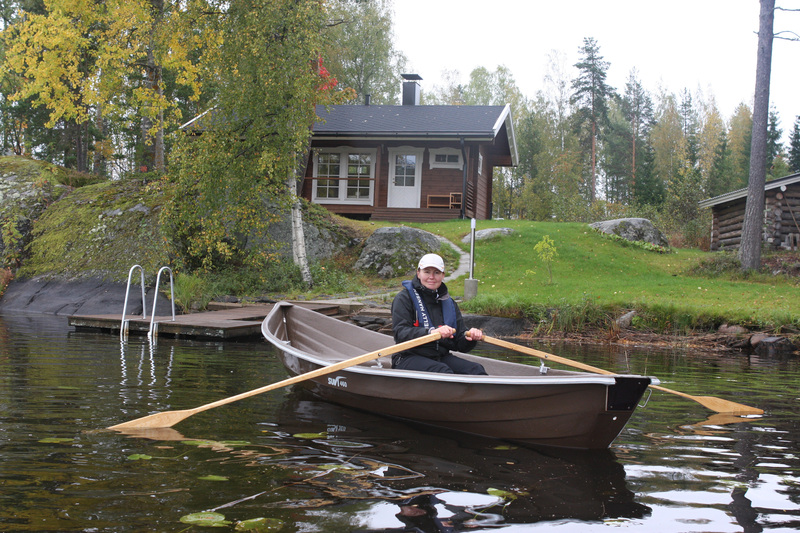 A summer cottage and netting boat similar to the Kala-Palta, only smaller. 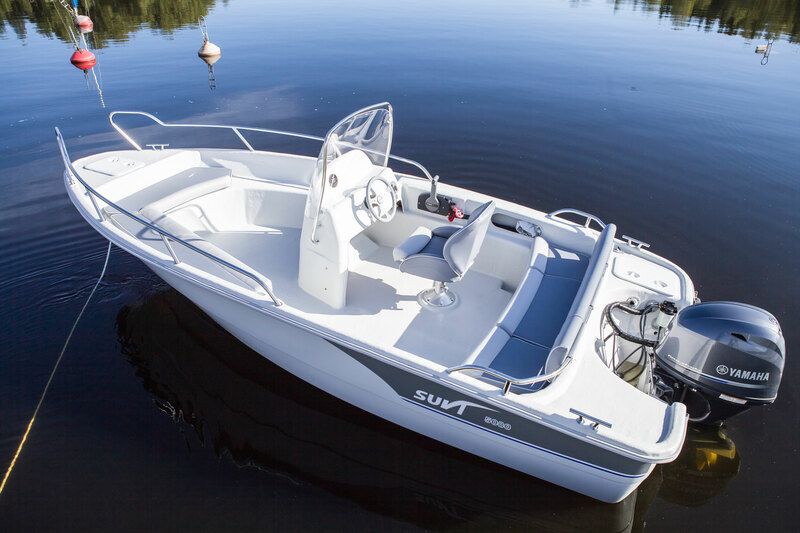 A large, open interior space and keel ensure that the boat is an excellent fishing buddy for you. Also available with fixed steering console (Kala-Kaveri R) and optional accessories. Also available without steering console (Kala-Kaveri MV). Two different models. For a short or long shaft engine. 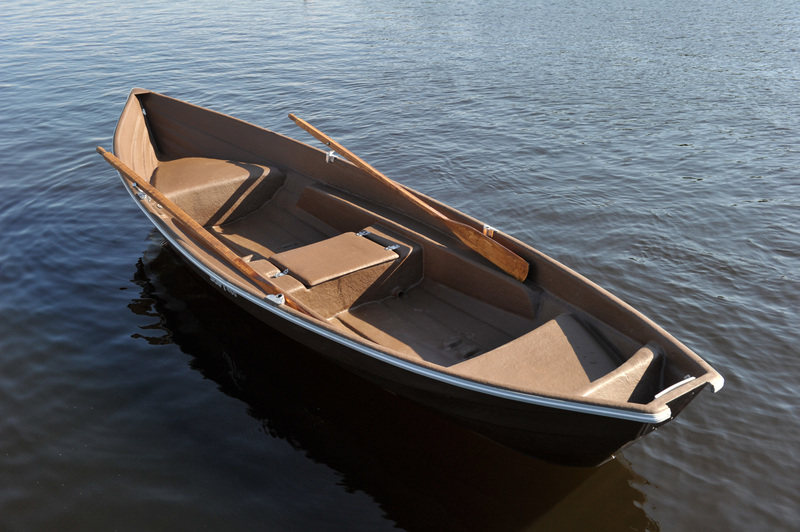 A large rowboat with a planing hull for 5 people. 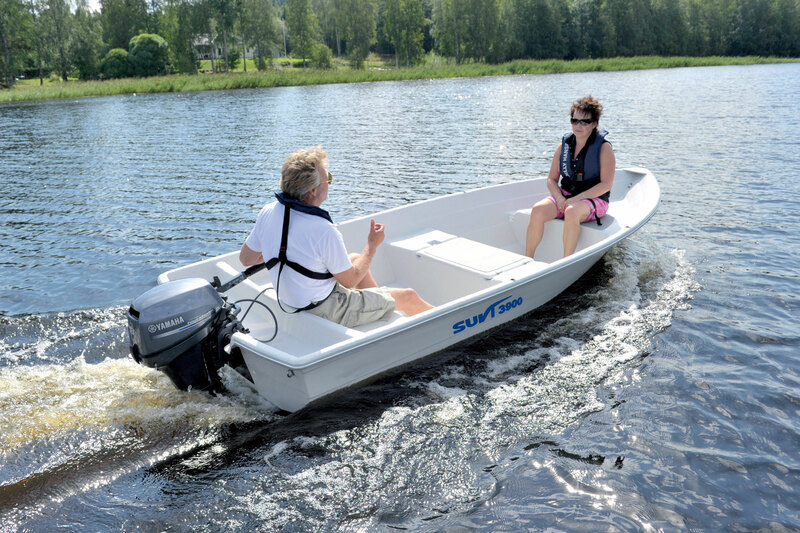 Can reach a speed of 10 knots on a 6 hp engine. Large, open interior space and even deck. The model is extremely stable athwartship. An excellent netting boat, which rises to plane on a small engine, and travel position remains good even while carrying just one person. 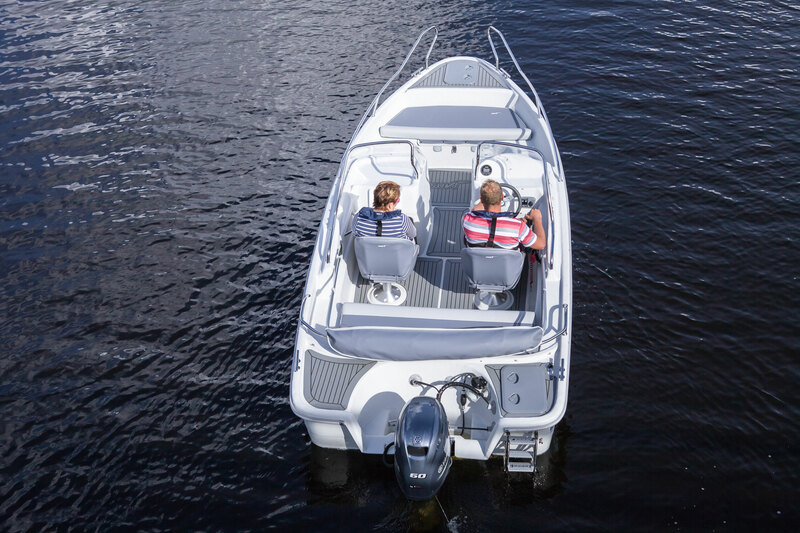 The boat has two locking stowage spaces and an engine well to facilitate driving with an engine. For a short shaft engine. 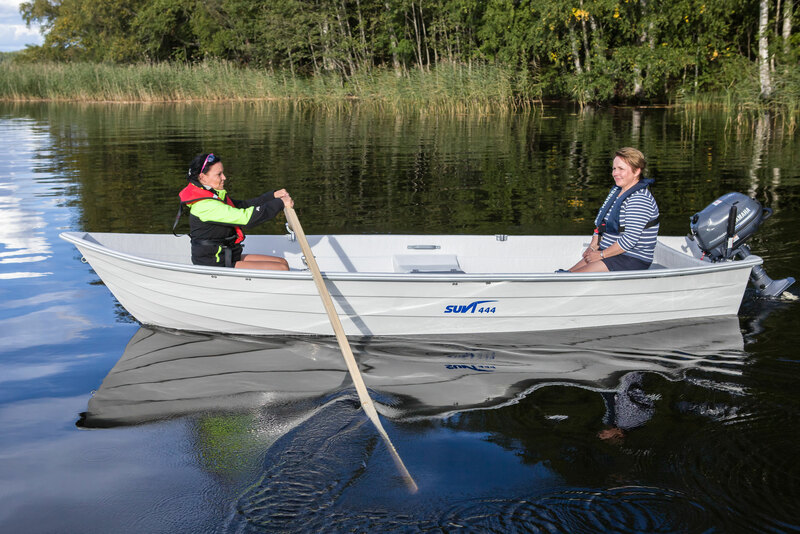 Soutu-Palta 495 is a steady, safe and unsinkable rowing boat from the popular Palta collection. 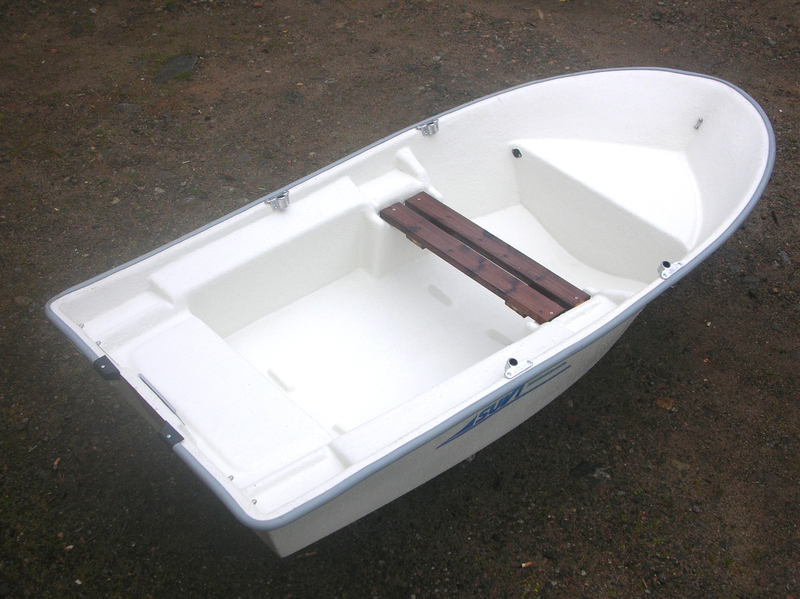 Ideal for summer cottage use and fishing. 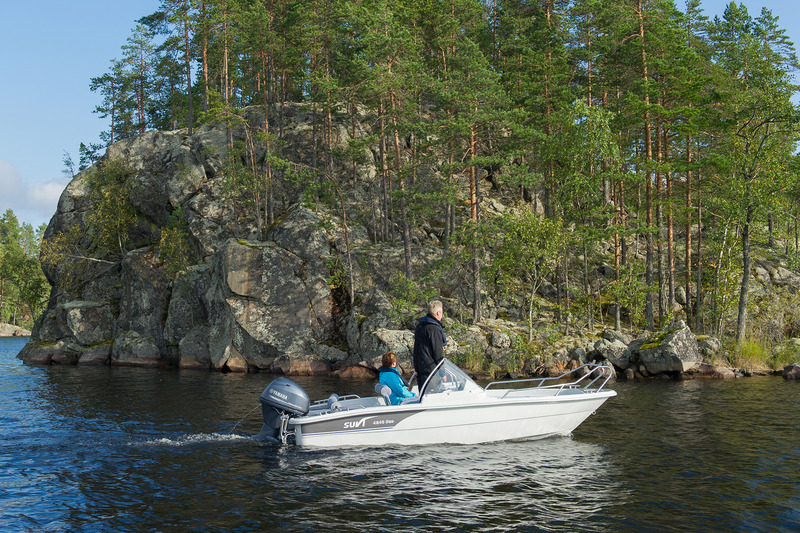 The hull design enables a better travelling position even while driven alone with an engine. 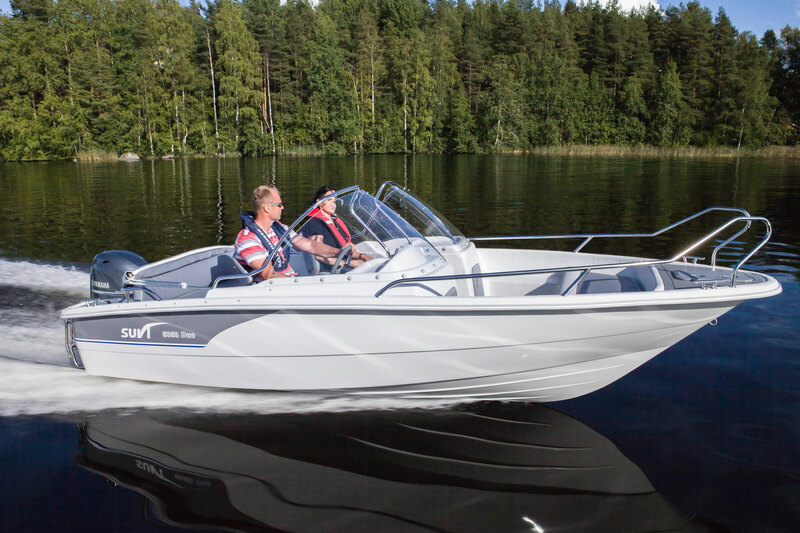 The boat has two locking stowage spaces and an engine well to facilitate driving with an engine. 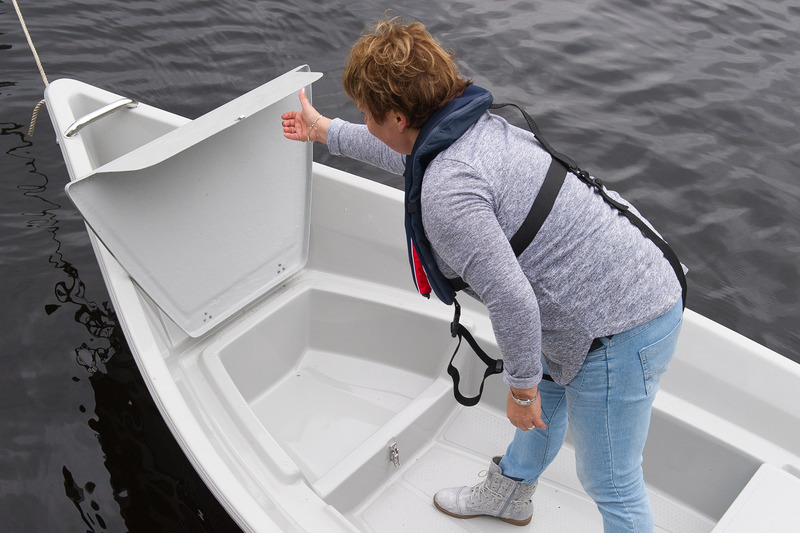 There is an aluminium edging strip on the boat for net fishing. 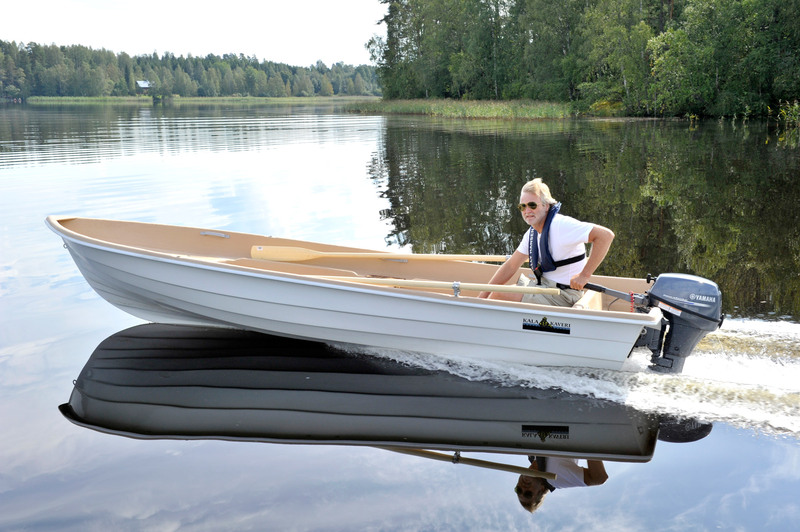 The design of the boat accommodates an electric engine. For a short shaft engine. 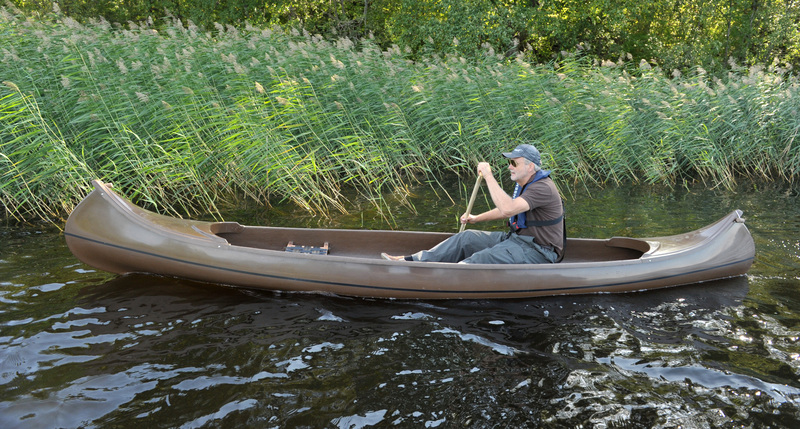 Affordable Suvi-Inkkari canoes for hiking and exercise, or duck hunting if you like. 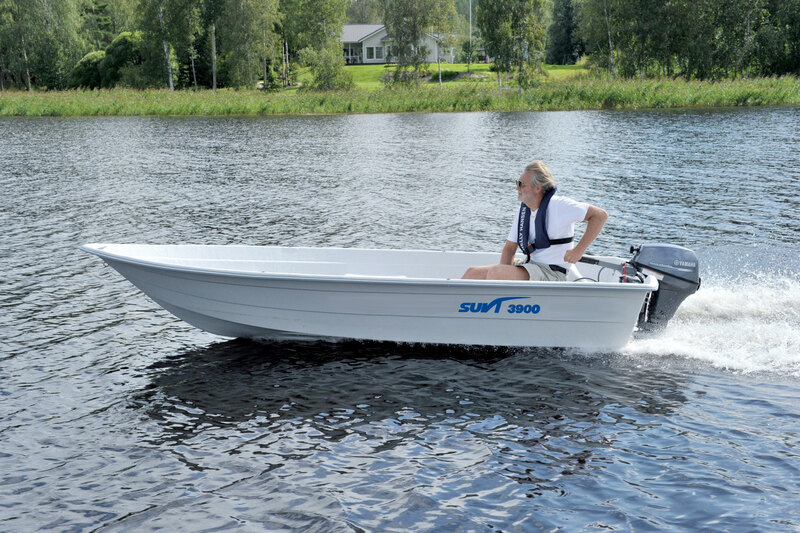 The larger Suvi-Inkkari 500 with two stowage spaces. 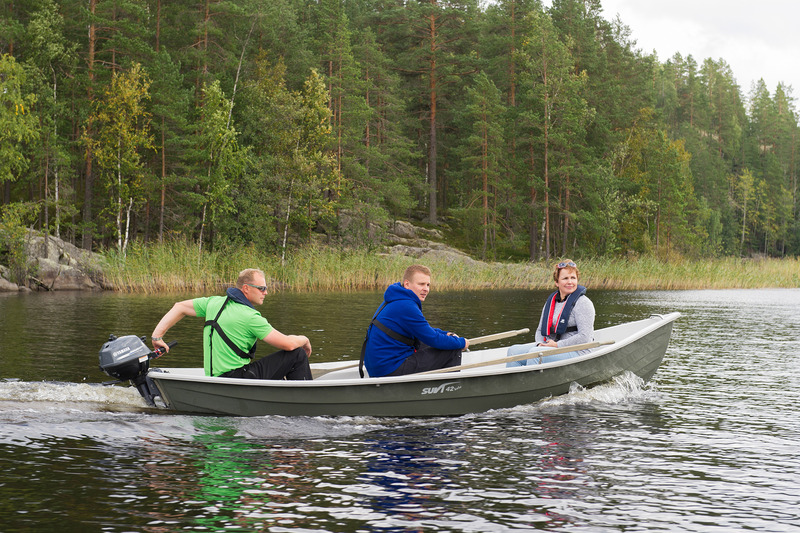 Canoeing is a nice and relaxed way of moving in nature independently. 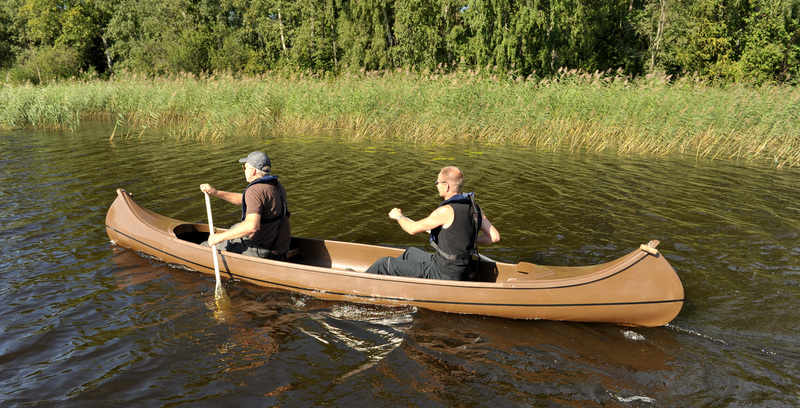 Affordable Suvi-Inkkari canoes for hiking and exercise, or duck hunting if you like. Canoeing is a nice and relaxed way of moving in nature independently.